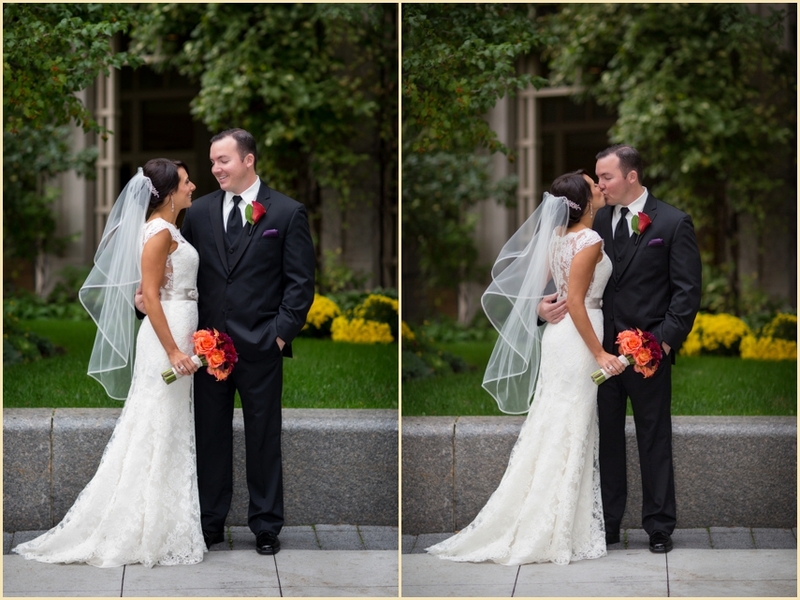 Elana and Pete met while working for the Boston Red Sox. 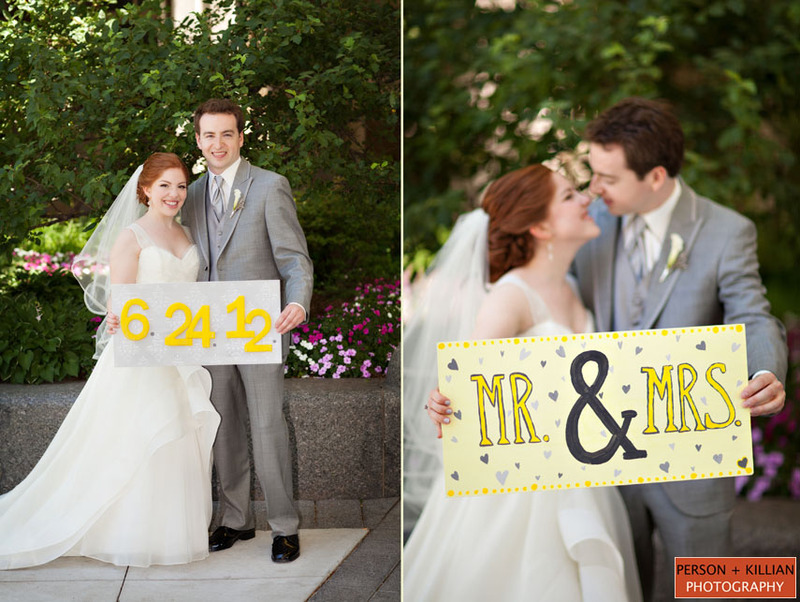 The couple worked together and were friends for many years before they started dating. 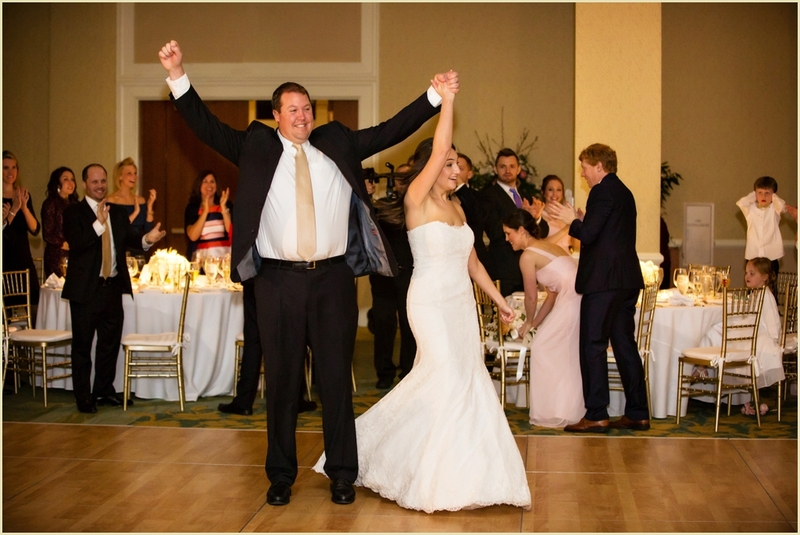 Elana knew it couldn’t be better professionally than to see the team win the World Series at Fenway Park back in 2013 and left to pursue her teaching career. 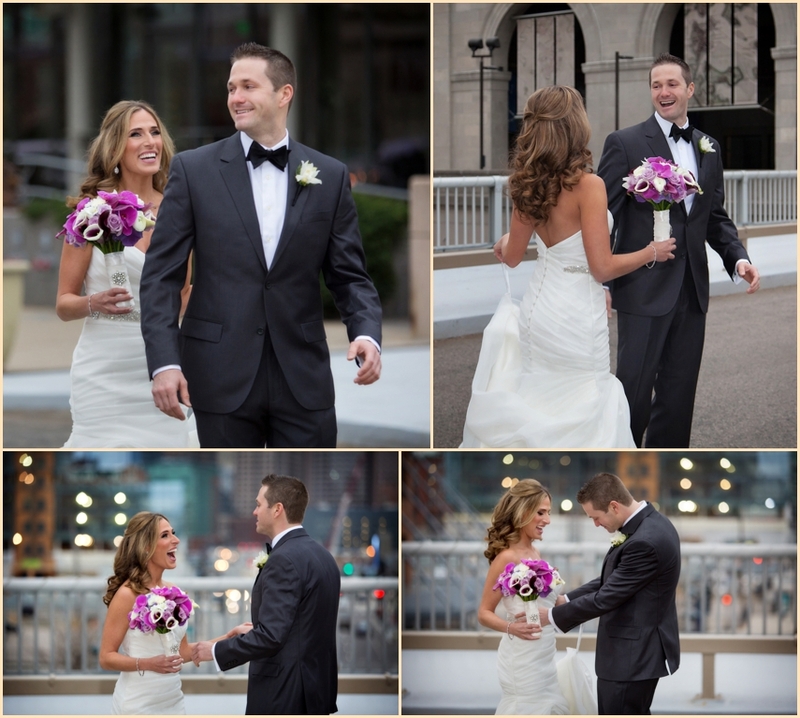 Although she misses working with the team, she couldn’t imagine life without Pete. 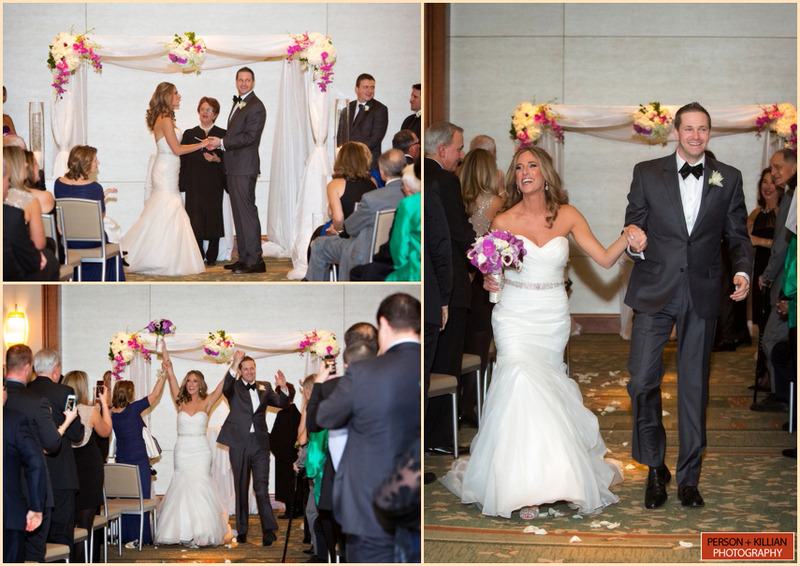 When Pete and Elana chose the Seaport Hotel Boston for their winter wedding, they were told throughout their planning that they were crazy to plan a wedding in February (the snowiest month of the year). 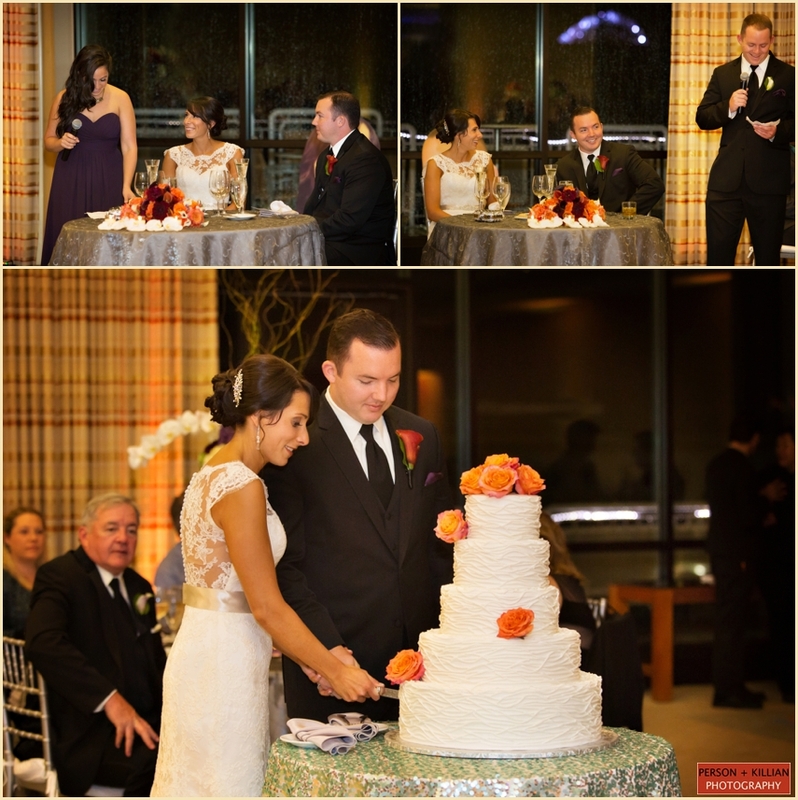 The couple knew they made the right decision and made many preparations in case it was snowing or below freezing so their guests would be comfortable. 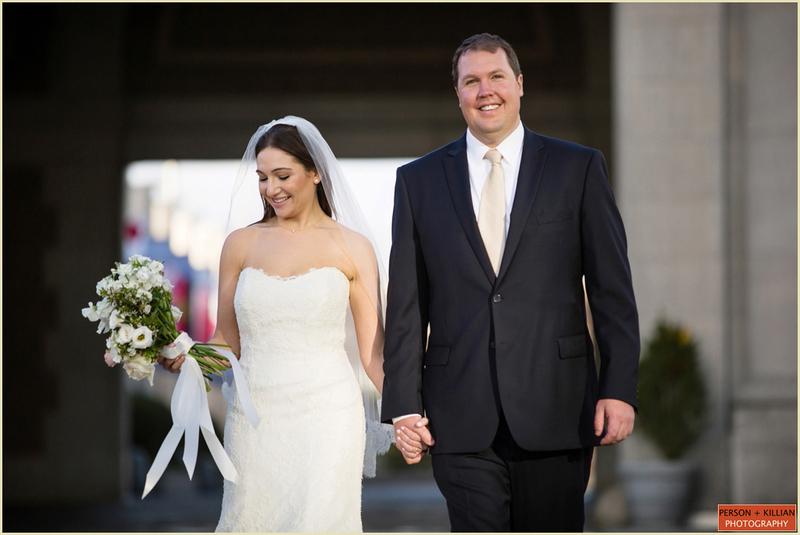 So, it was a very welcomed surprise when the wedding day came and the temperature was in the 60’s! 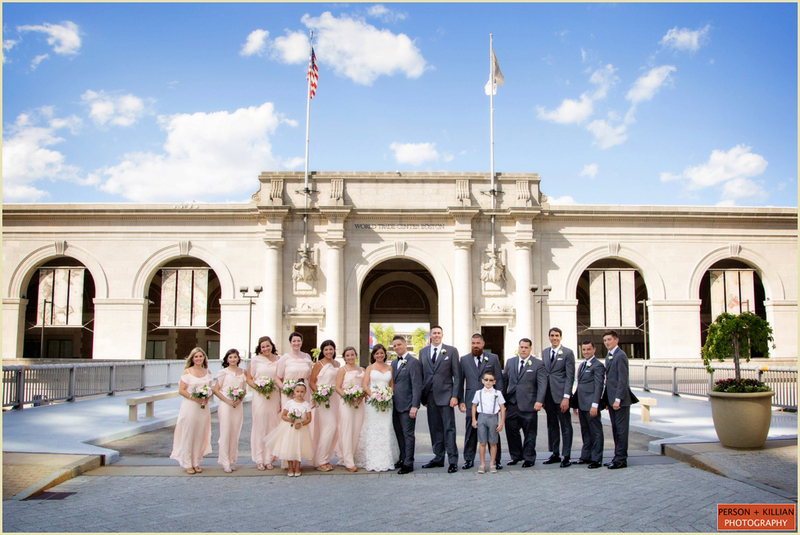 With the warm sun and spring like breeze, we were able to spend the afternoon outside for all of the photos with the family and wedding party. 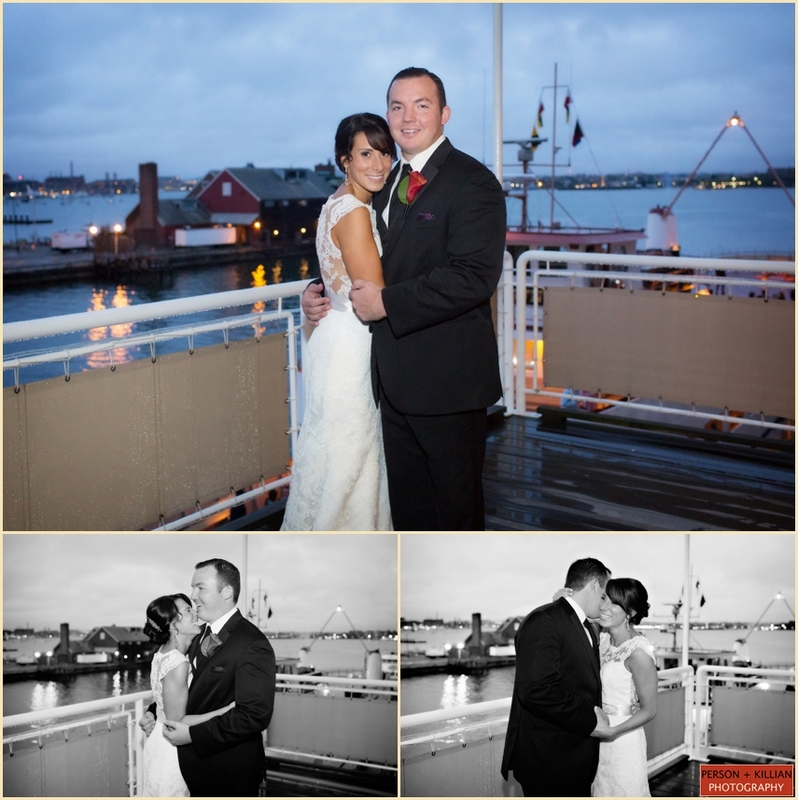 From the bride: The Seaport was out perfect venue. 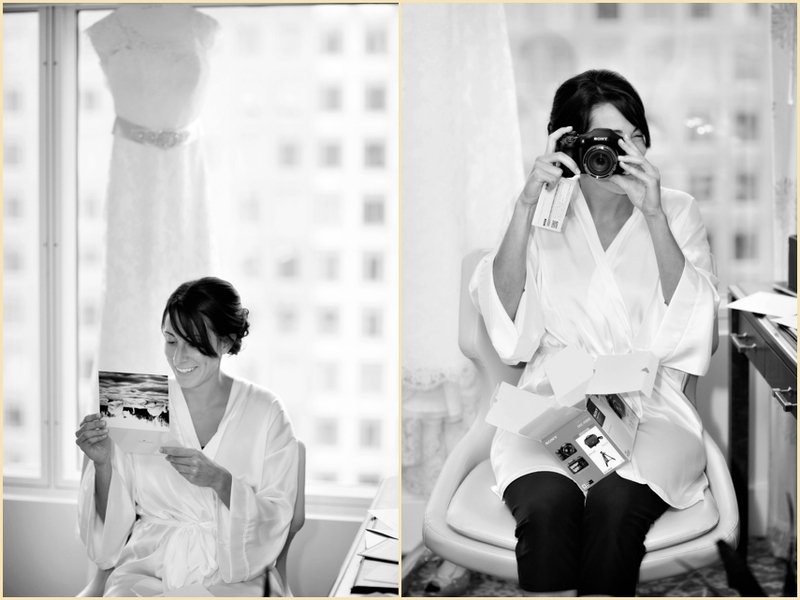 We loved working with Melissa who made sure that we had everything we needed (including making sure to have the Fenway inspired late night snacks). 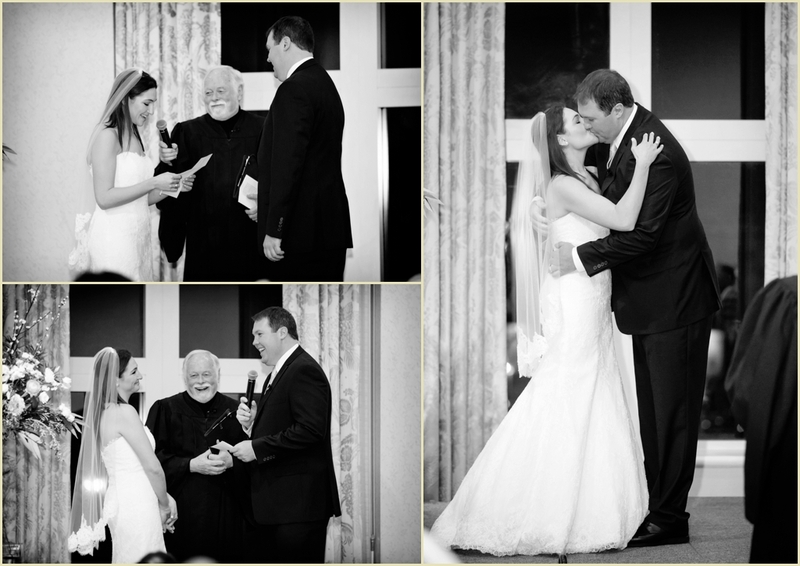 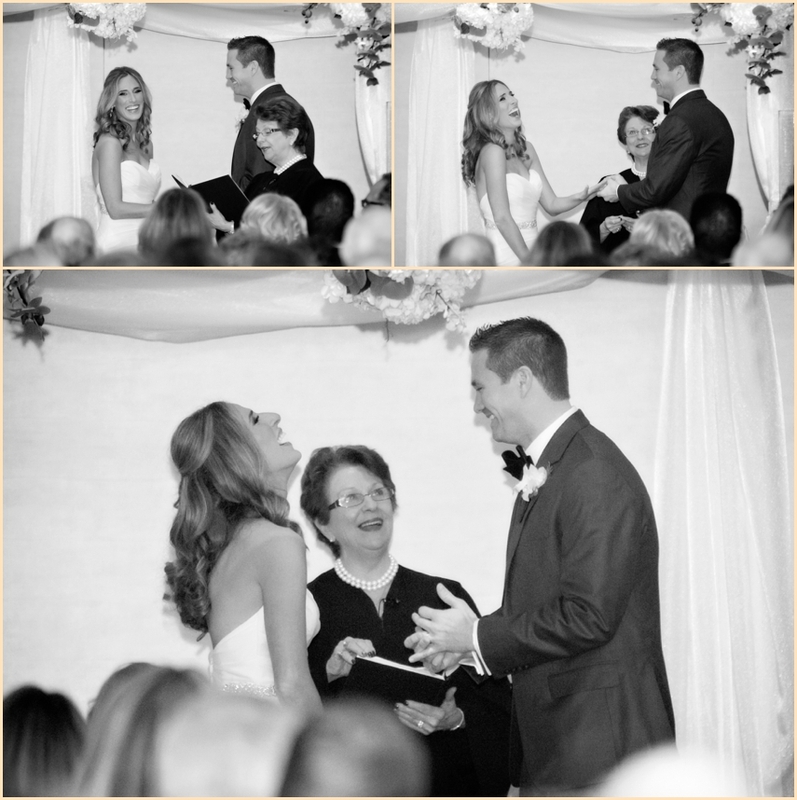 We loved being able to exchange our own vows before doing the traditional vows. 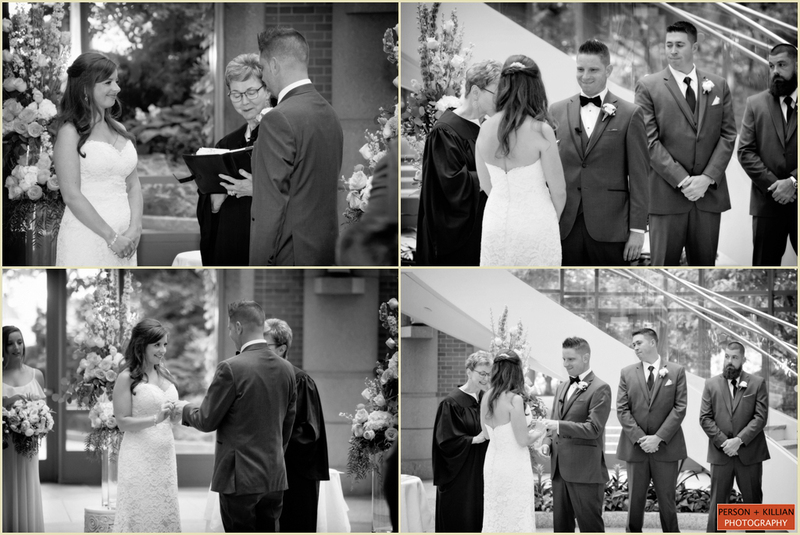 It was important to us to have a ceremony and a wedding that really felt like it reflected us. 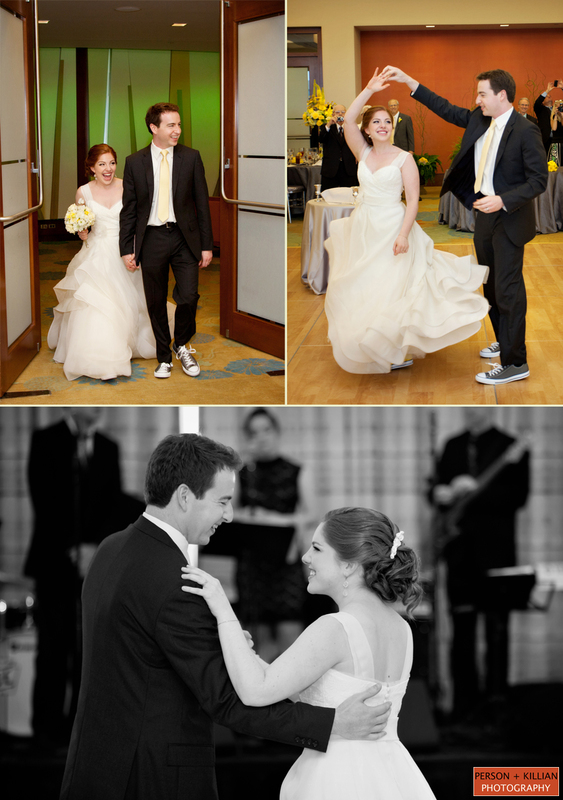 We wanted it to be both personal and fun and are so happy it turned out that way! 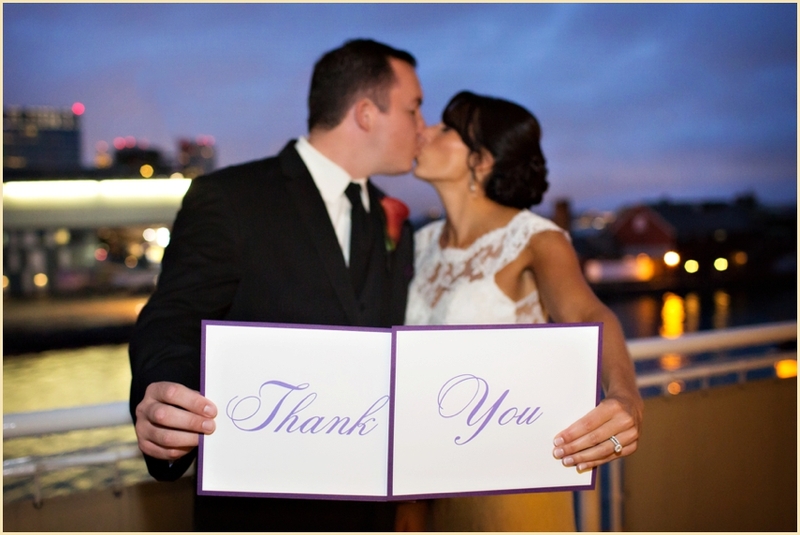 A big congratulations to Elana and Pete and thank you to Melissa and the team at the Seaport Hotel Boston for being so great to work with! 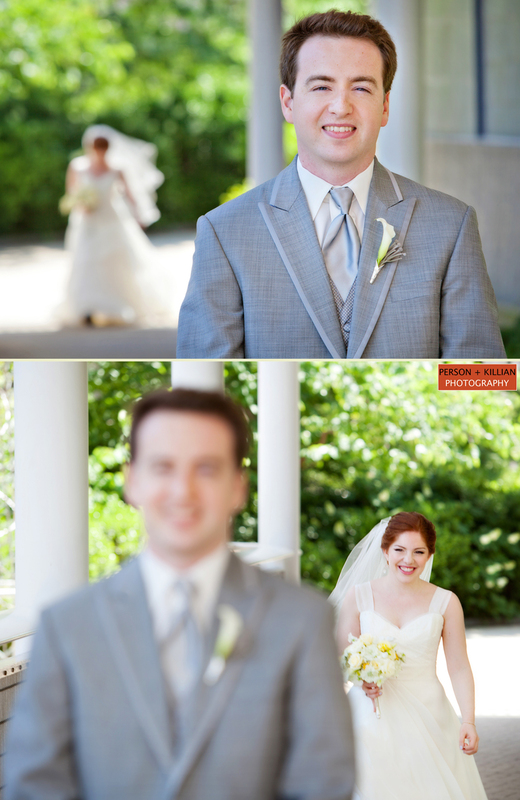 When Deena and Joel got engaged they knew that they wanted a classically refined summer wedding. 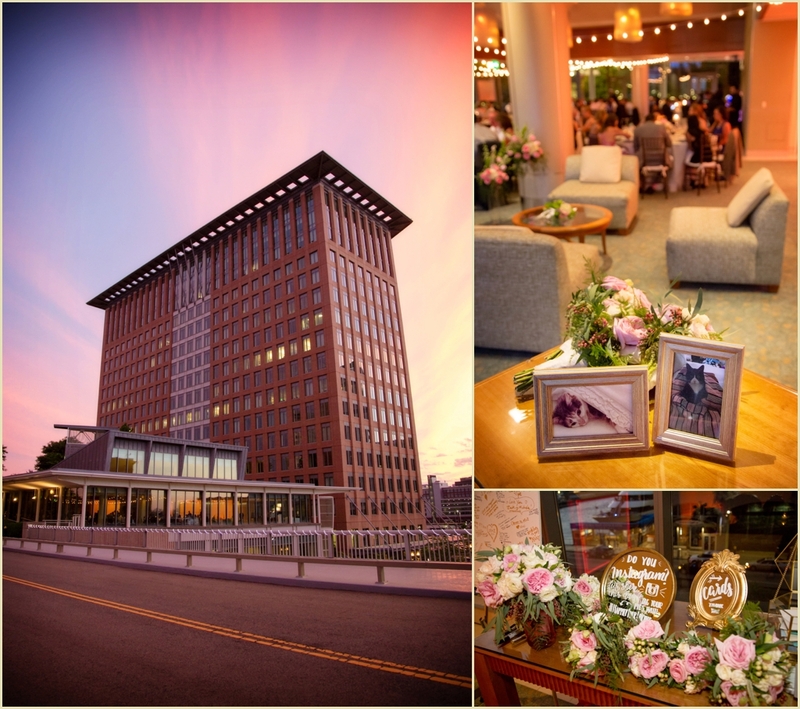 Overlooking the harbor, the Seaport Hotel located in the heart of Boston’s historic seaport, boasts no shortage of lovely spots (and photo locations!) 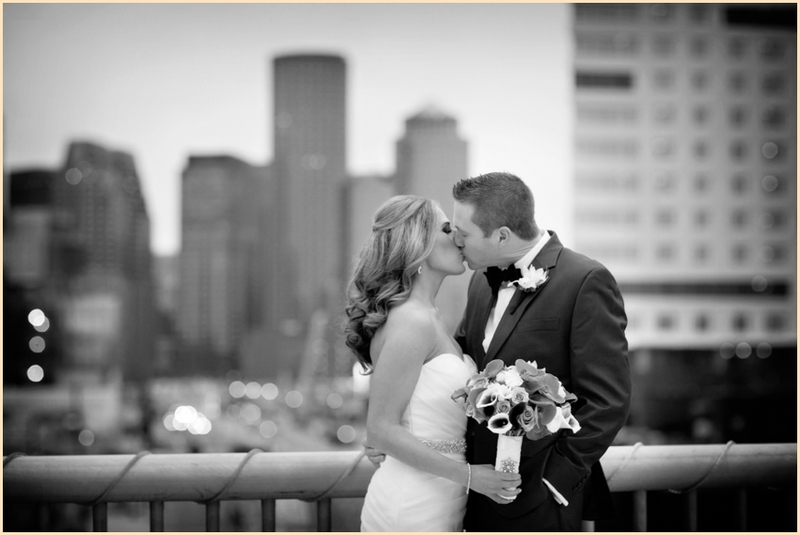 to enjoy; it turned out to be the perfect waterside location they were looking for! 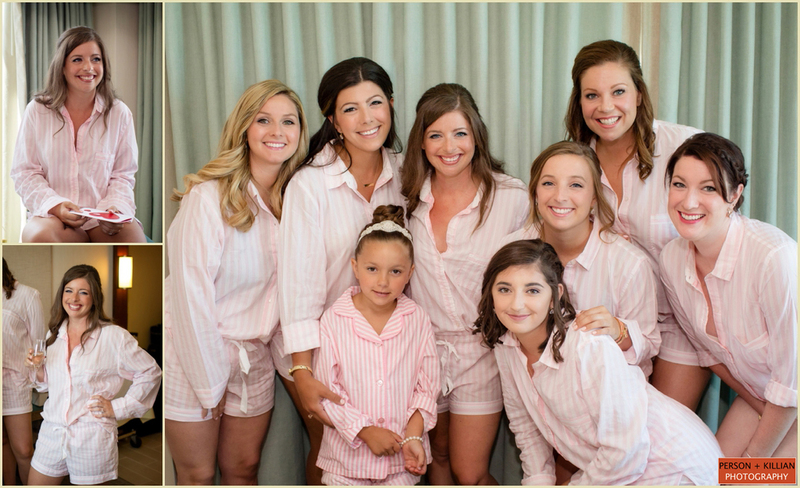 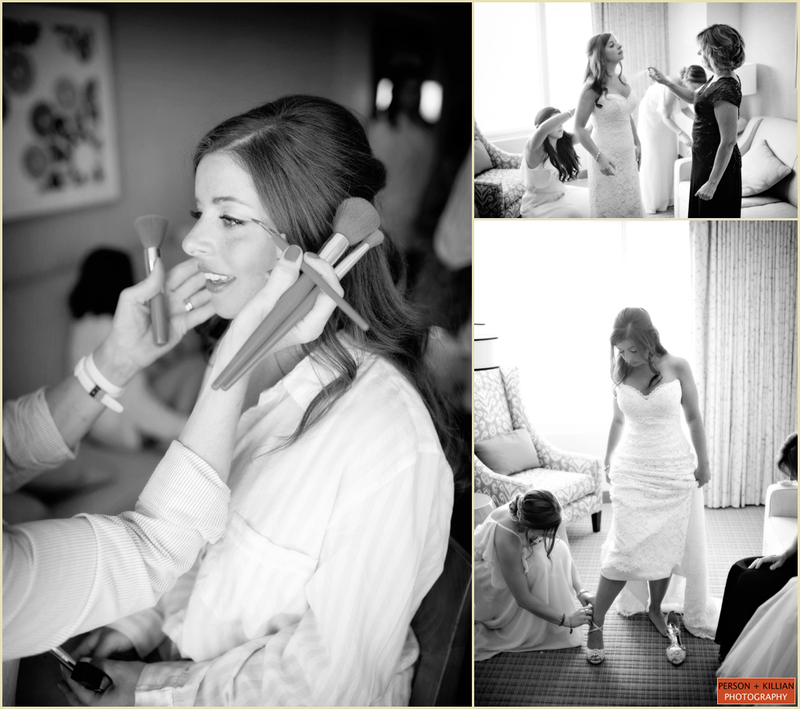 We begin the beautiful August day gathered in the bridal suite where the girls were clearly having a blast getting ready together. 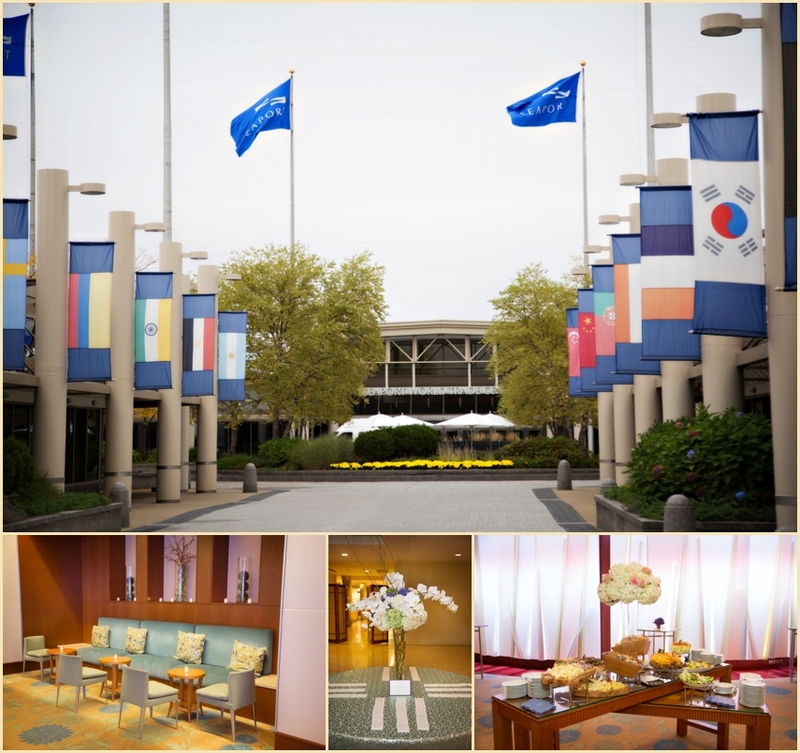 The atmosphere was fun and filled with excitement for the upcoming day. 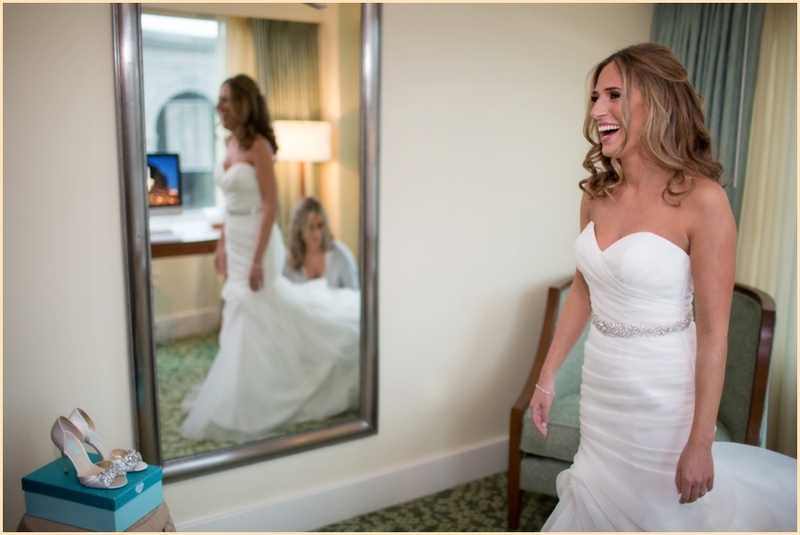 The sweet flowergirl, Bri, almost stole the show but Deena’s stunner of a dress, a lovely Watters gown, ensured all eyes were on this beauty. 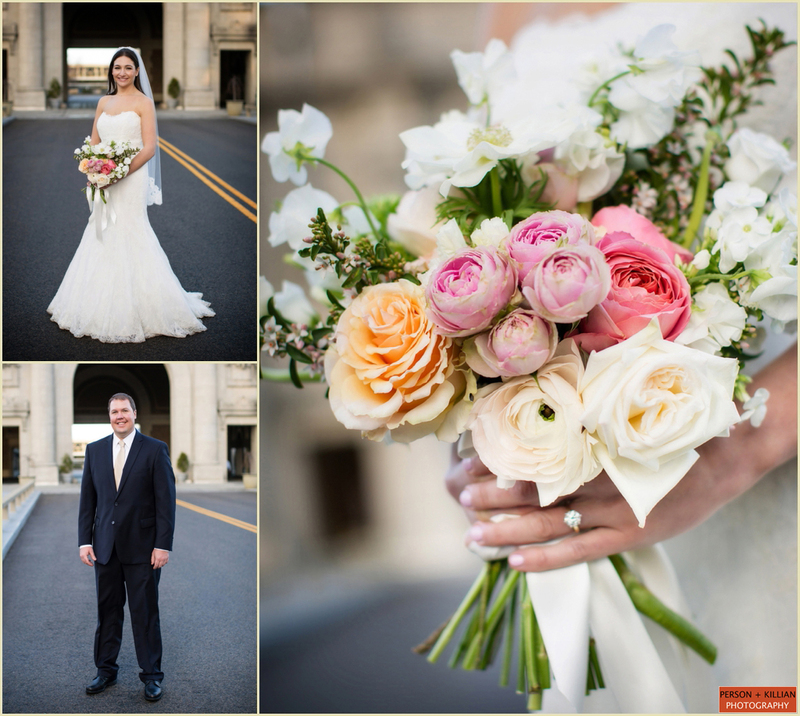 The bride completed the look with timeless pearls and a bouquet of fresh summer flowers of garden roses, ranunculus and dahlias. 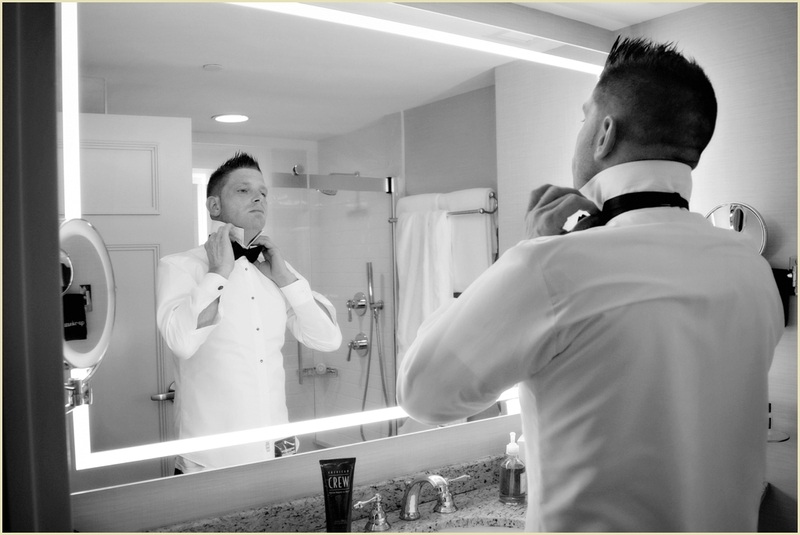 The gentleman spent some time prepping together too, gathering together with Joel while he suited up for the couple’s first look. 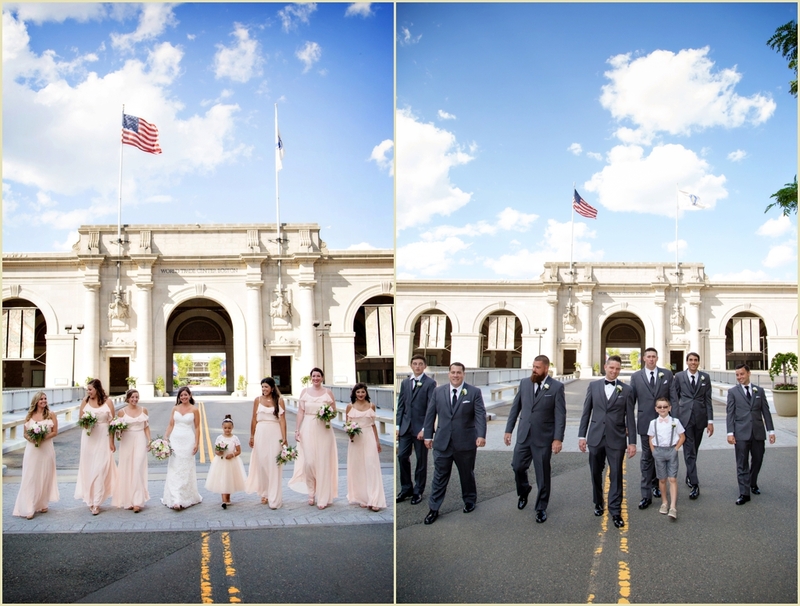 Taking advantage of the perfect day, Deena’s & Joel’s first look took place outside where they had a private moment before heading off to capture fun shots of the whole wedding party. 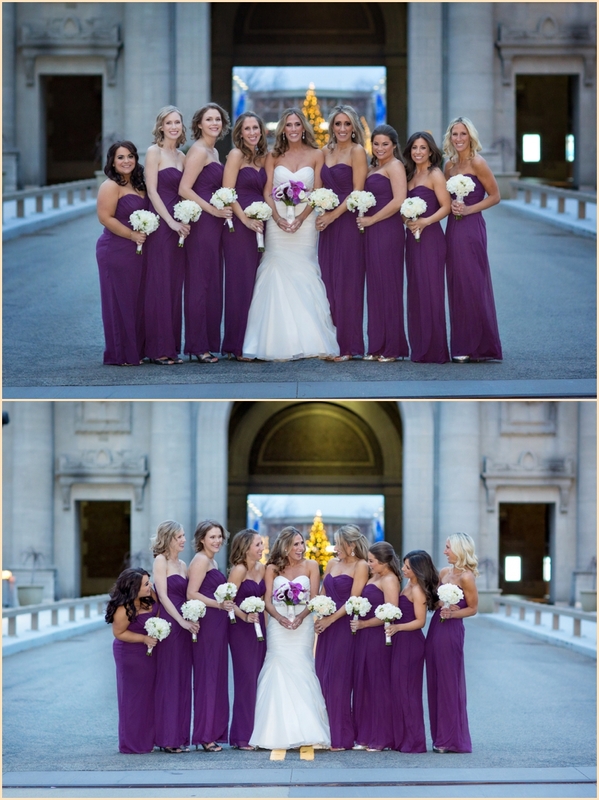 The bridesmaids looked like a summer breeze in their dresses perfectly complimented by the groomsmen in crisp gray suits. 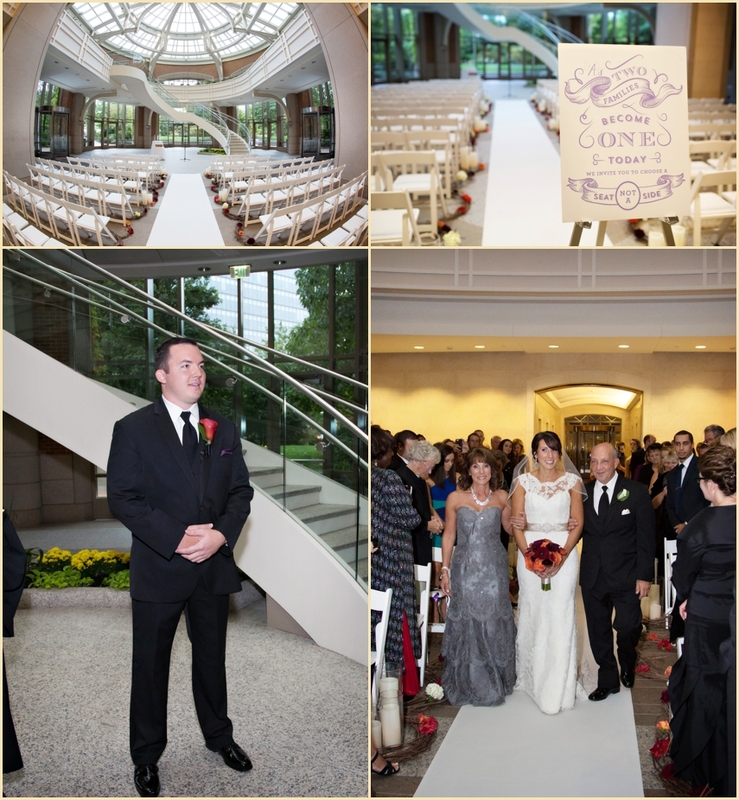 The ceremony took place in an elegant ballroom where rose petals adorned the aisle and a backdrop dripped in light. 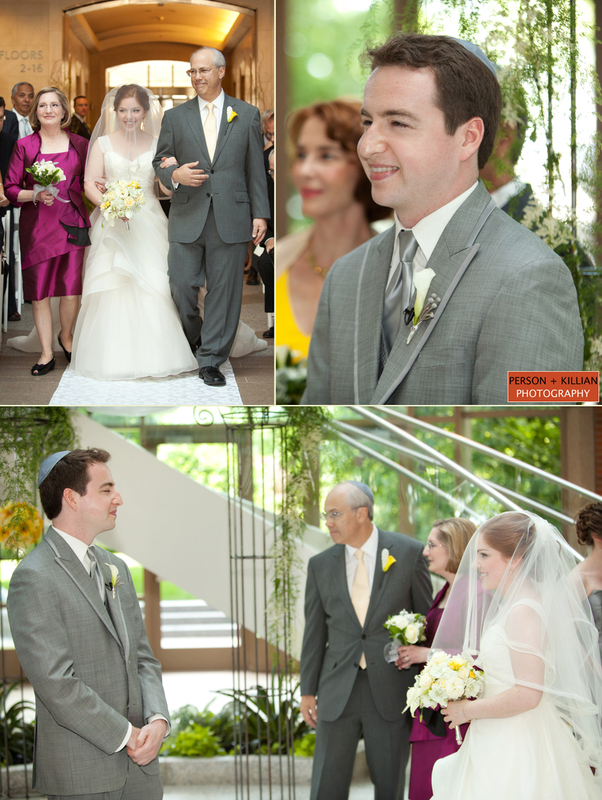 The look on Joel’s face as Deena walked down the aisle said it all. 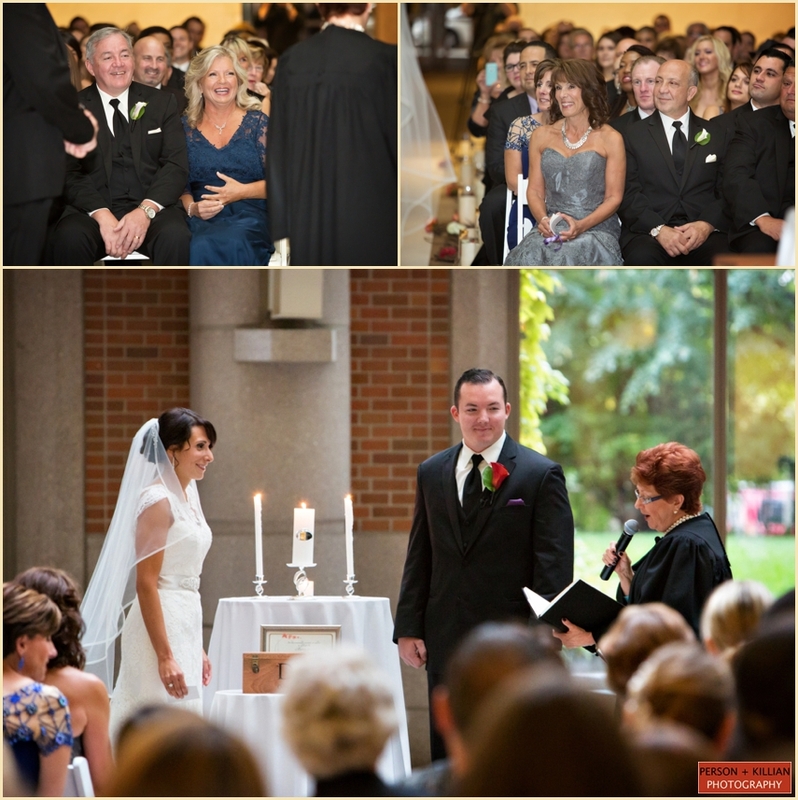 Officiating the ceremony was Joel’s grandfather adding personal touches and tender words of encouragement to Deena and Joel as they exchanged lifelong vows. 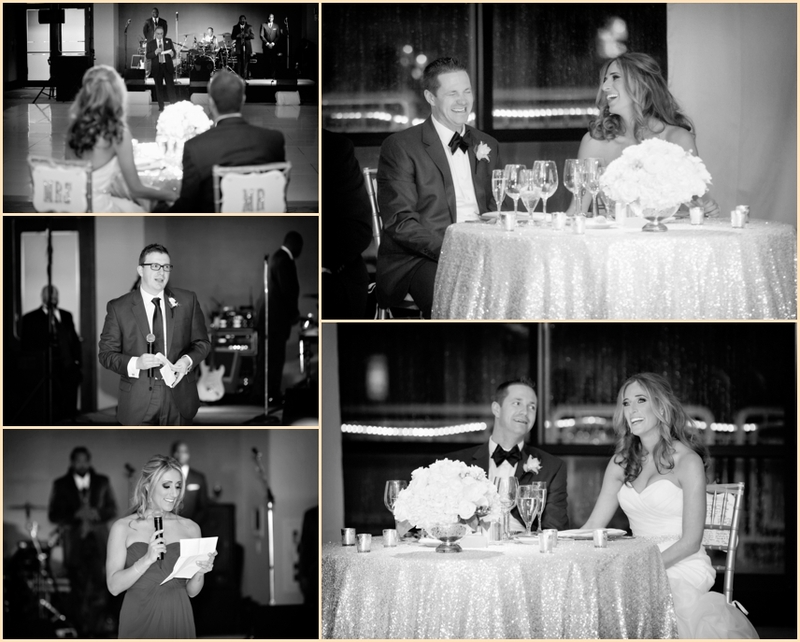 Following the ceremony, the newlyweds and wedding party joined in on the fun as guests sipped on the couple’s signature cocktails while enjoying hors d’oeuvres and good conversation. 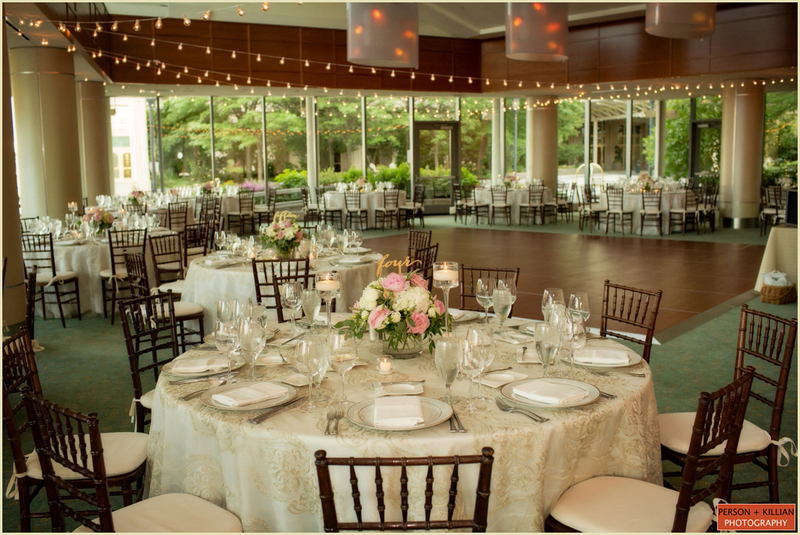 The reception space was draped with flowing fabric and detailed lighting that reflected the stunning floral centerpieces that were both lush and vibrant making for an intensely romantic feel. 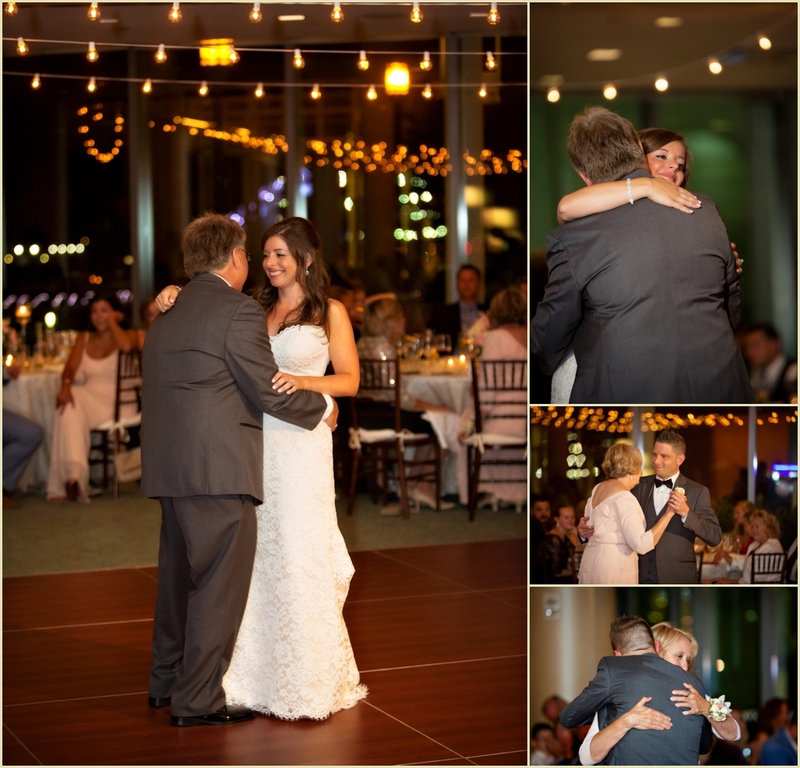 As the evening continued, the new Mr. and Mrs. spent time thanking their guests, dancing with loved ones and cutting a gorgeous five-tiered wedding cake. 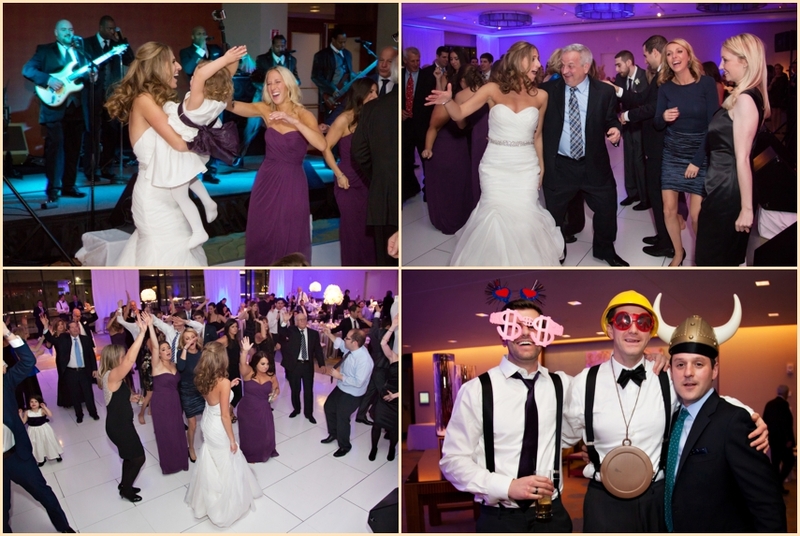 Once dinner progressed into dancing and the lighting dimmed, Beantown Band did what they are known to do – pack a dance floor and bring the house down! 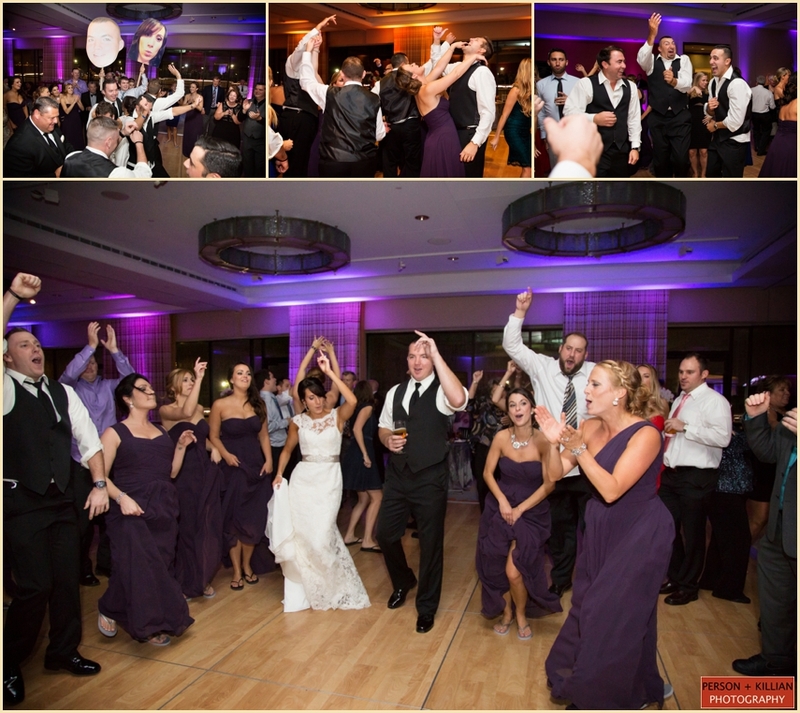 Wildly gifted and not afraid to join the party, we have so much fun capturing the candid joy the band brings to the guests. 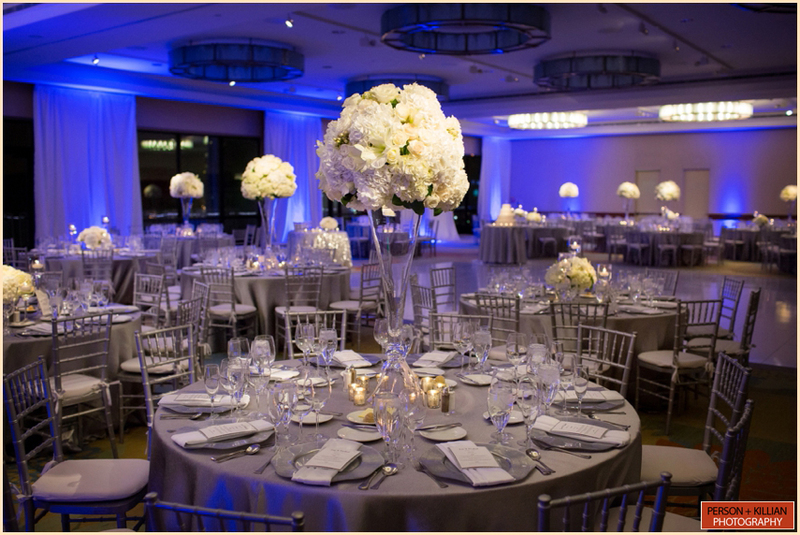 We always love working with familiar faces, and as always, enjoyed working with the planner, Ivy Finn from Event’s By Ivy and entire team at the Seaport Hotel Boston. 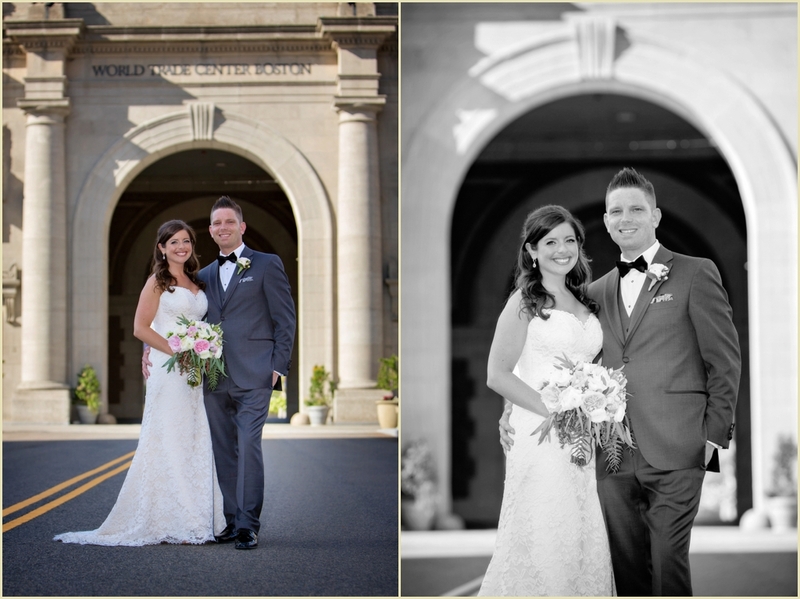 What a great time we had photographing this wedding! 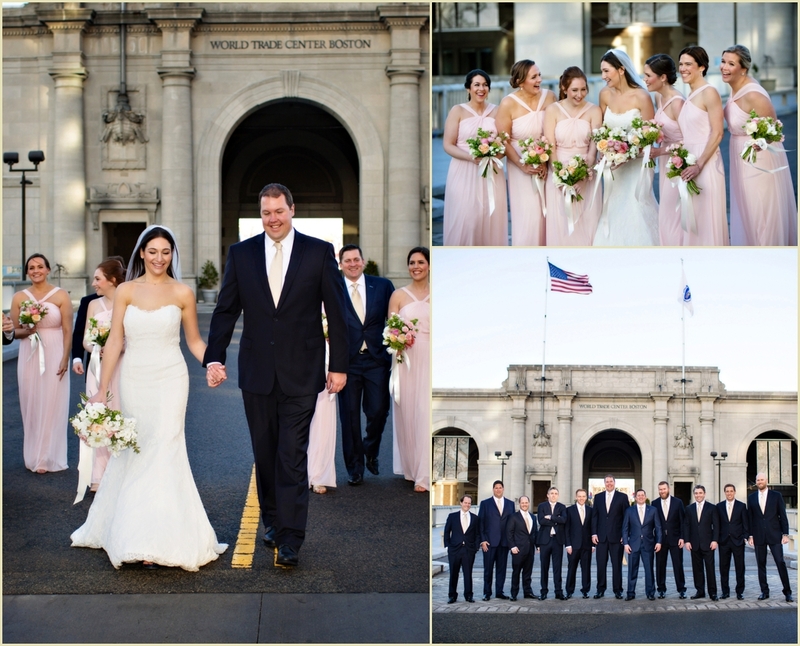 Congratulations again to Deena & Joel – it was an honor and thank you for choosing Person + Killian Photography to capture such a special day! 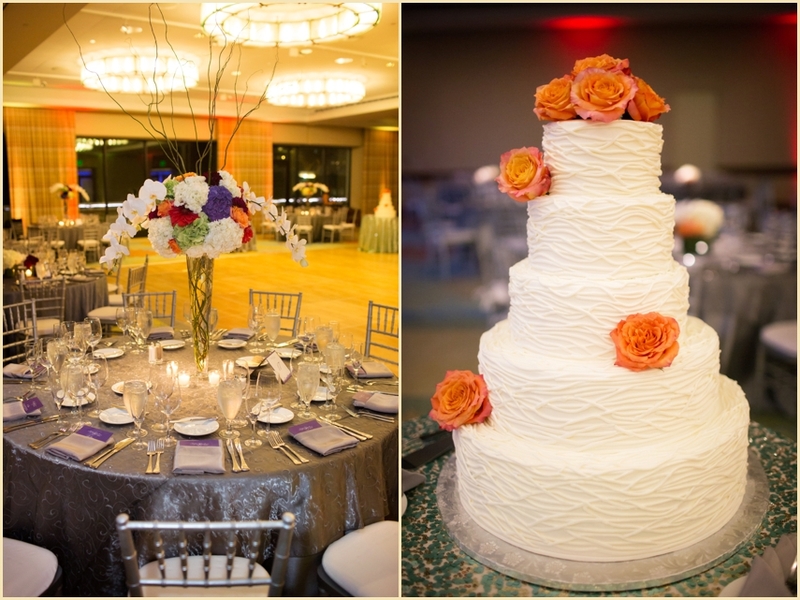 This post is filed under – Fun summer wedding in Boston’s Seaport Hotel with vibrant summer tones of pinks, oranges and grays. 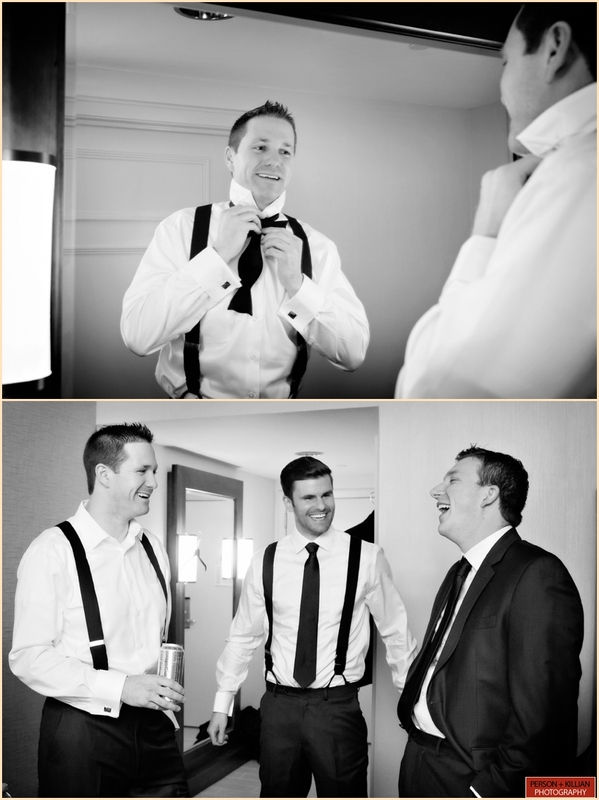 Candid wedding photography paired with wedding party formals by Person + Killian Photography. 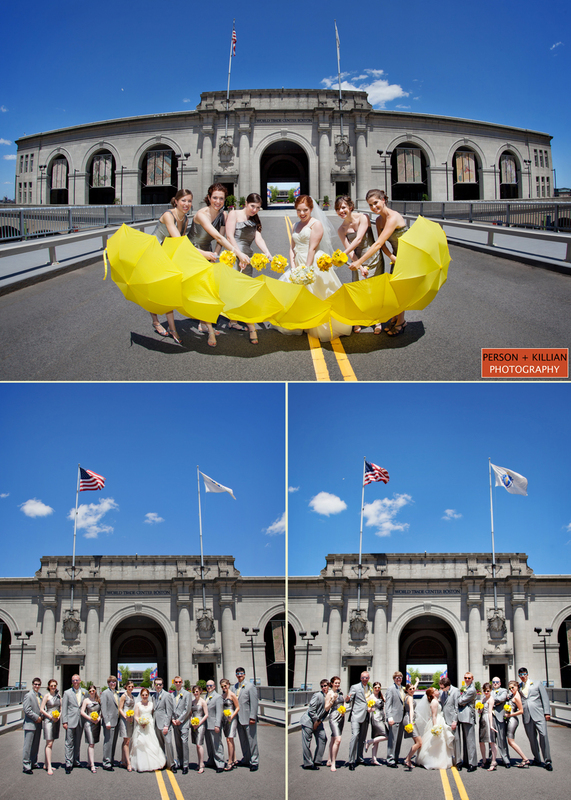 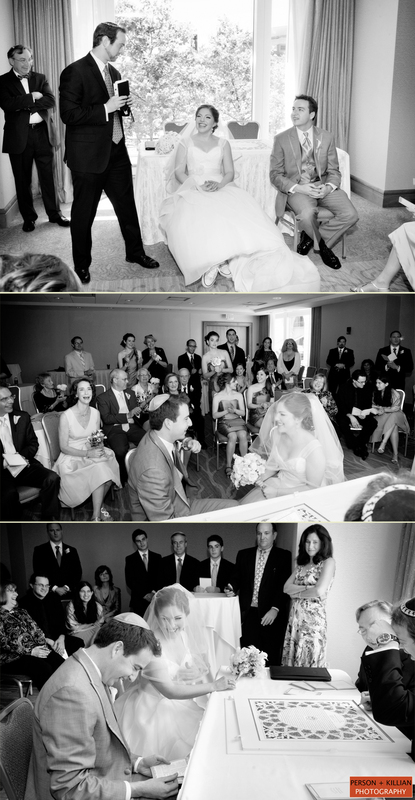 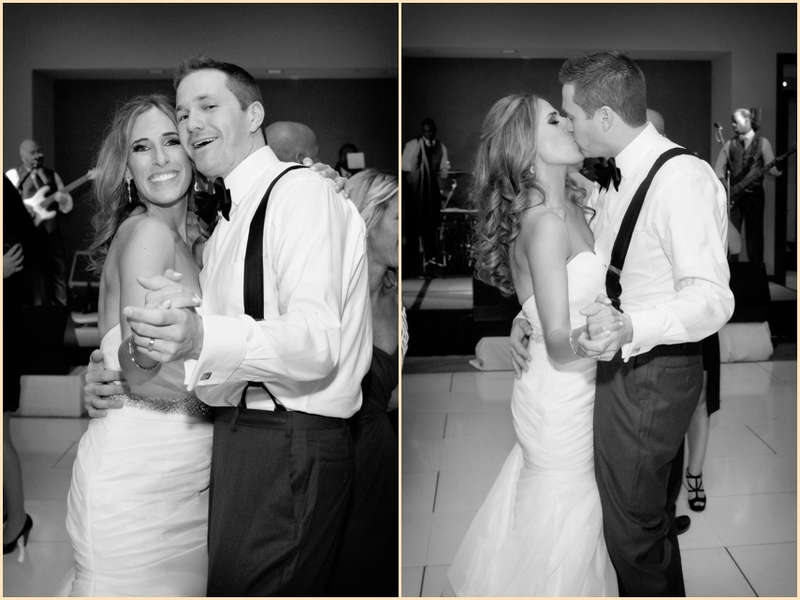 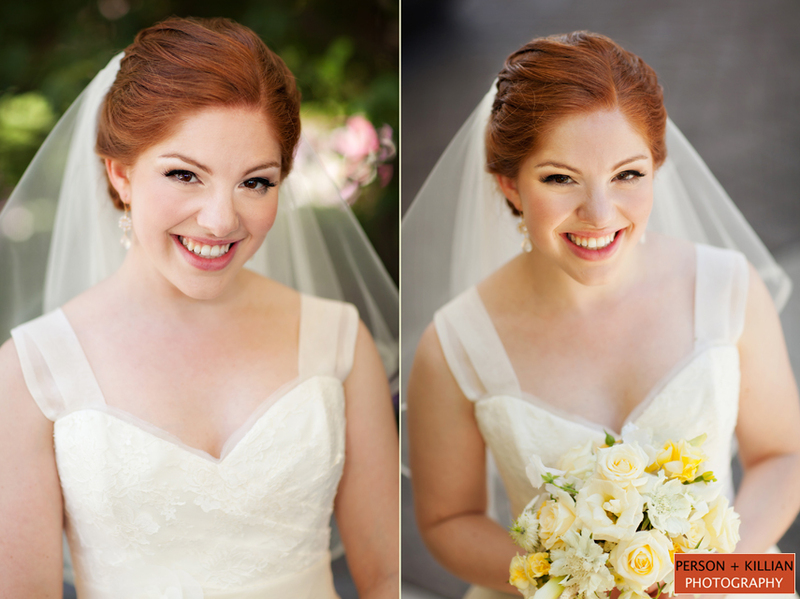 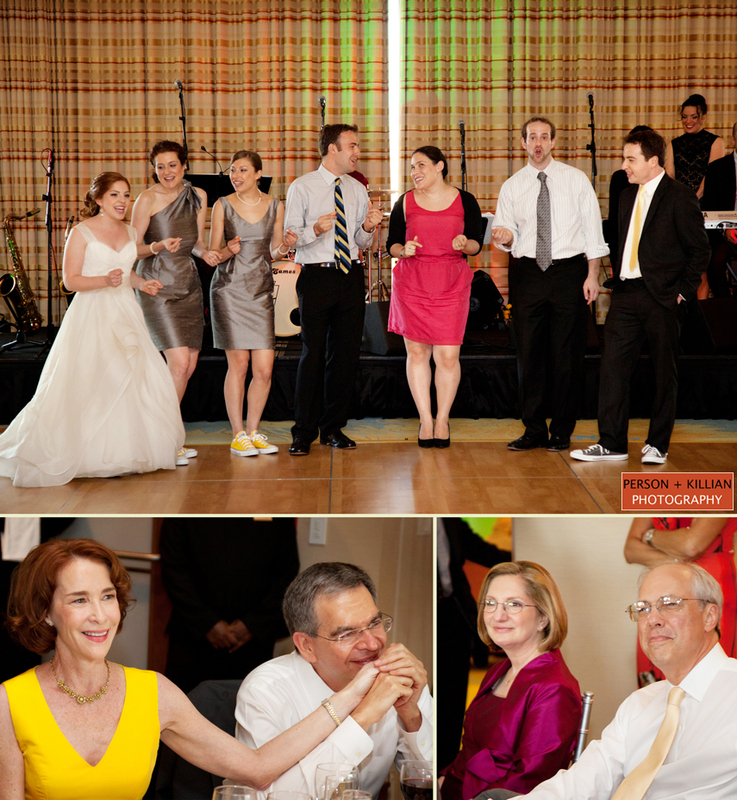 Boston Wedding Photography by Lauren Killian. 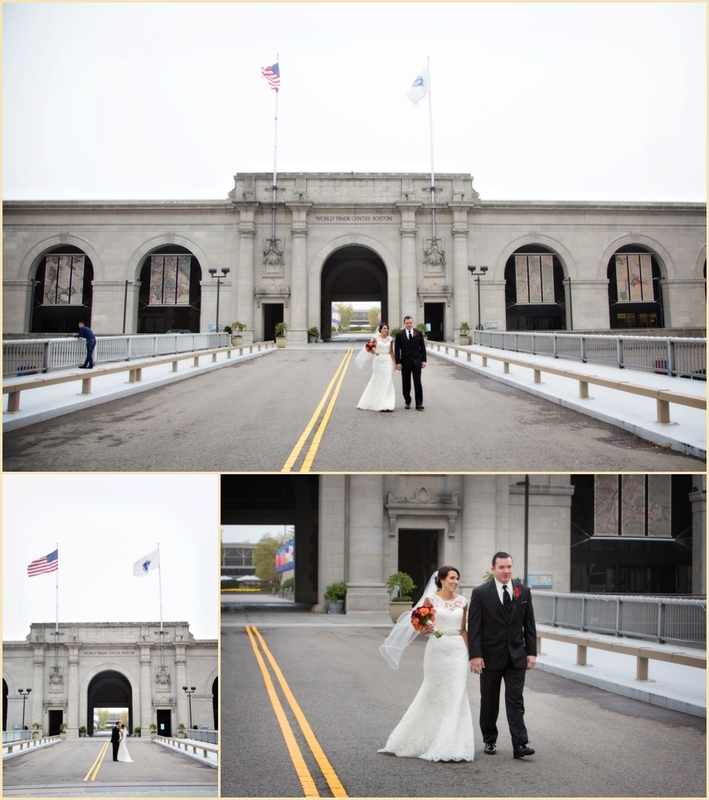 One of the absolute biggest honors for us is when someone in the Boston Wedding industry asks us to photograph their wedding. 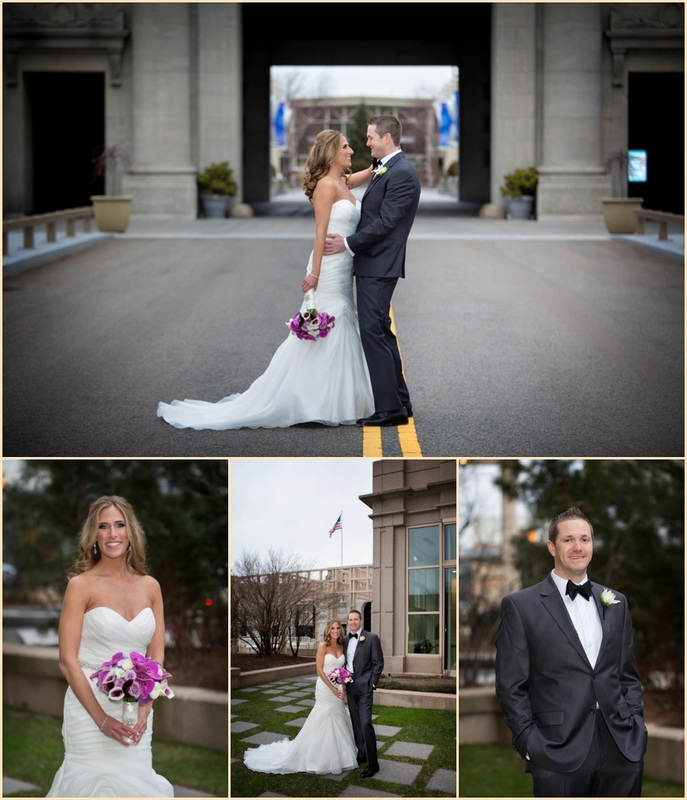 So, when our very dear friend and industry colleague Michele asked us to capture her wedding to Zack this July, it was an instant yes! 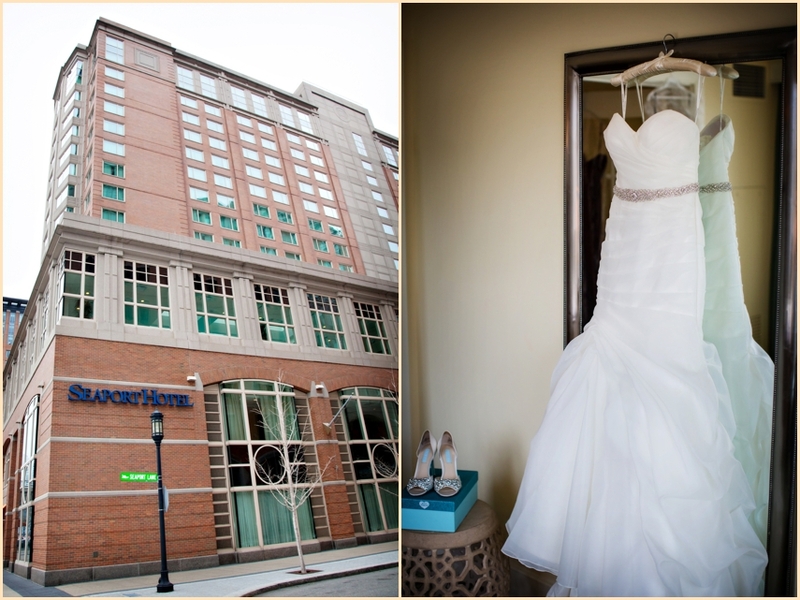 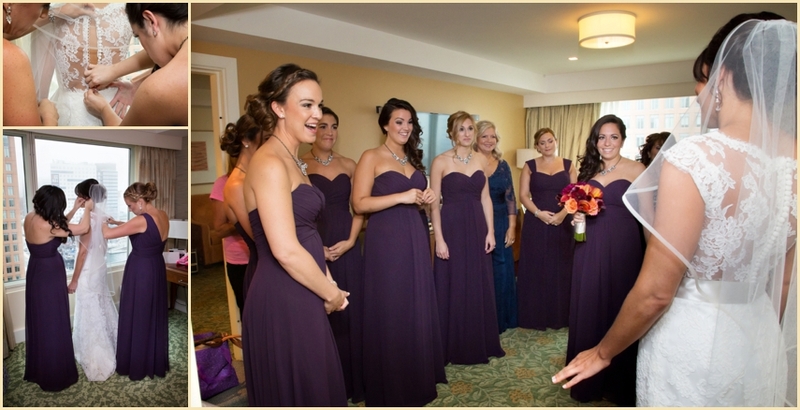 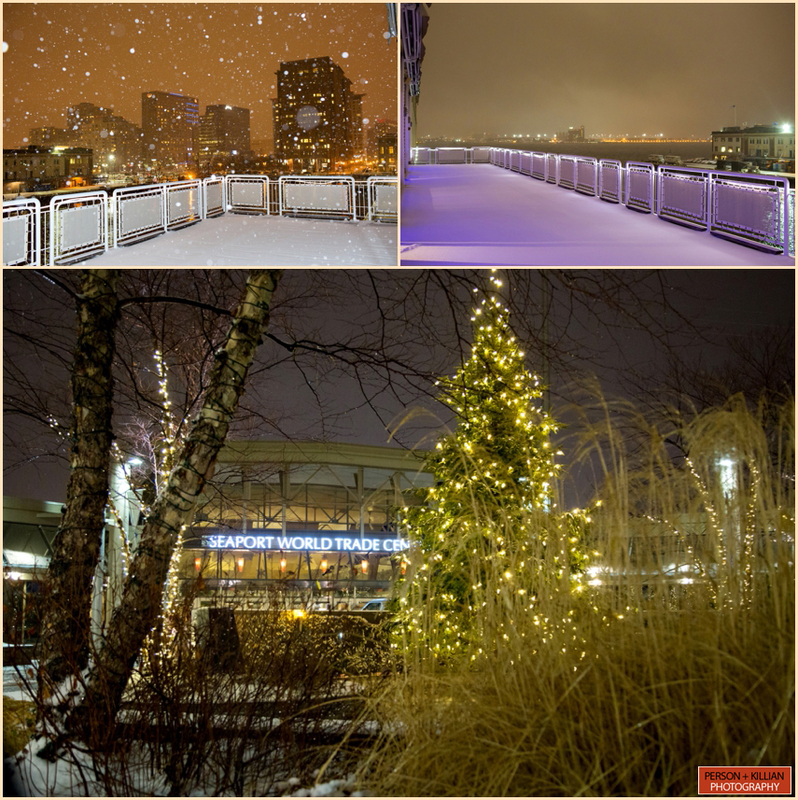 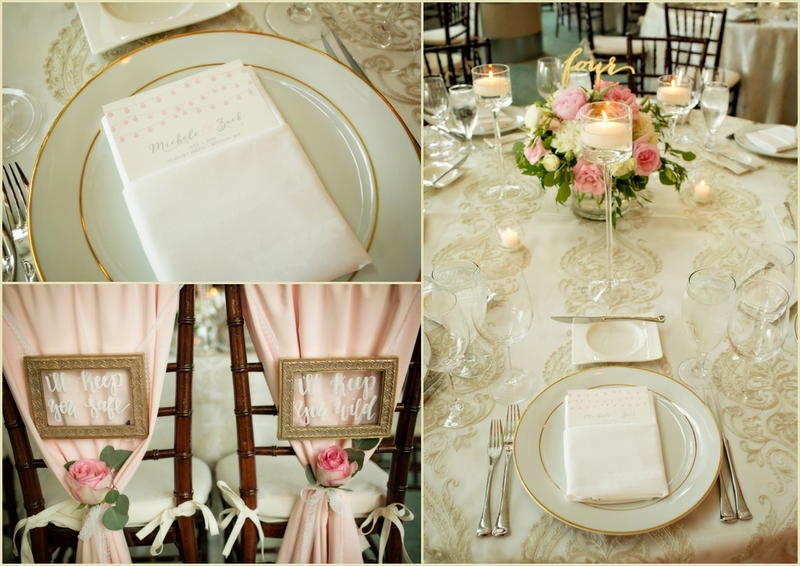 The Seaport Hotel Boston was the perfect location for the day from the getting ready to the evening celebration. 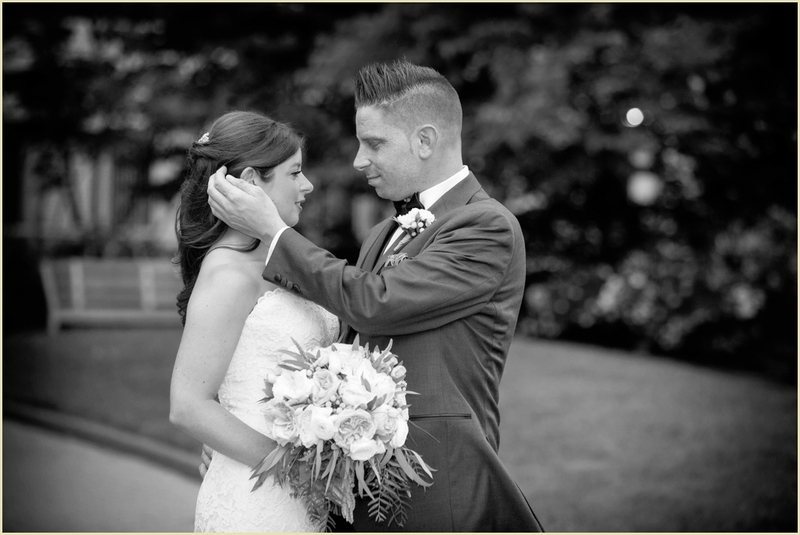 We asked Michele to share the inspiration behind her day: “Being a wedding planner and planning your own wedding is challenging and exciting all at the same time. 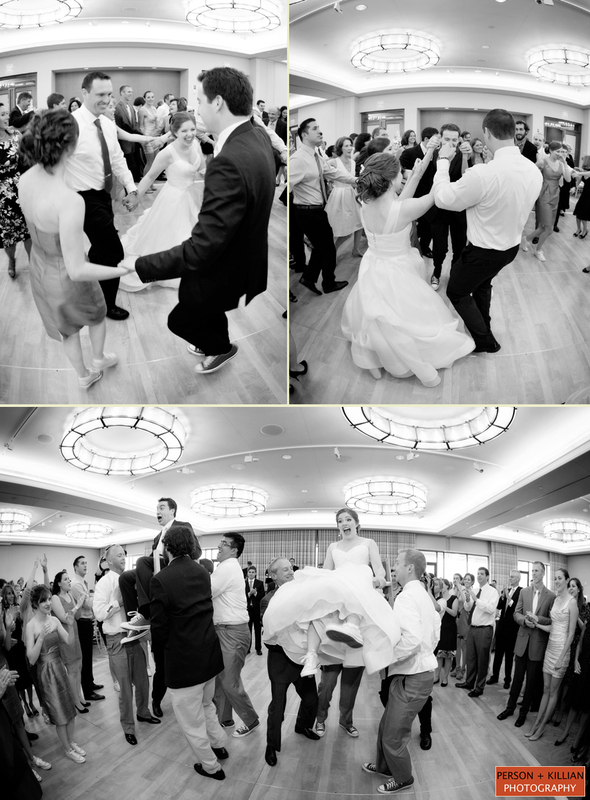 On one hand you have this great wealth of knowledge and experience to use when selecting a venue and vendors, reading through contracts etc., but on the other hand you are seeing things from a completely different perspective for the first time. 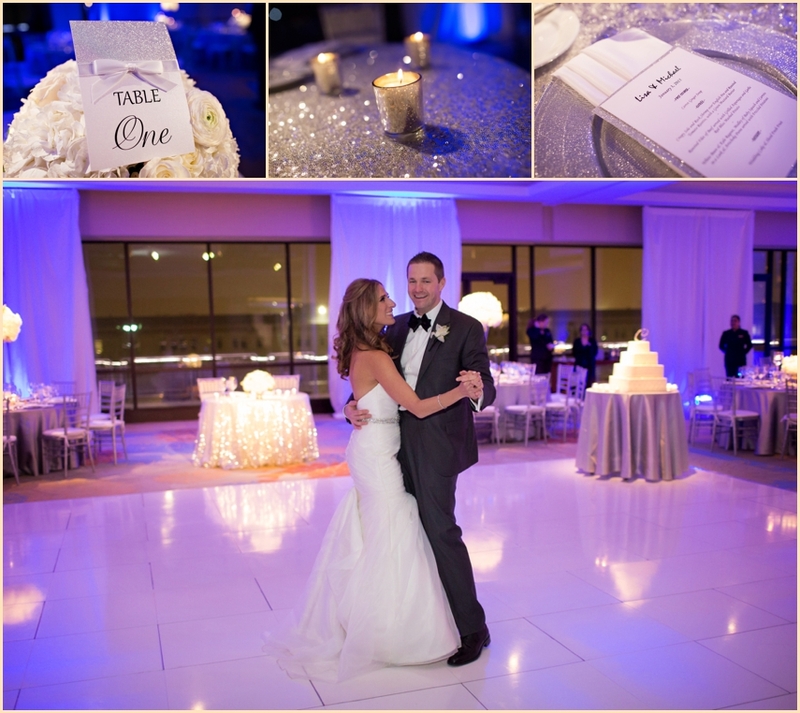 I knew right away that I wanted to be somewhere indoors in case of inclement weather, but wanted to create the feel of being outdoors which is where the Lighthouse Room and all of it’s floor to ceiling windows came into play. 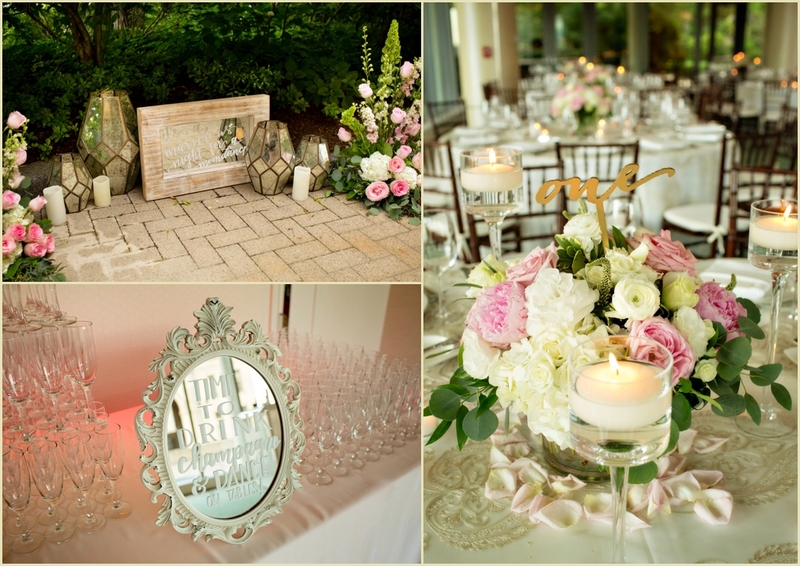 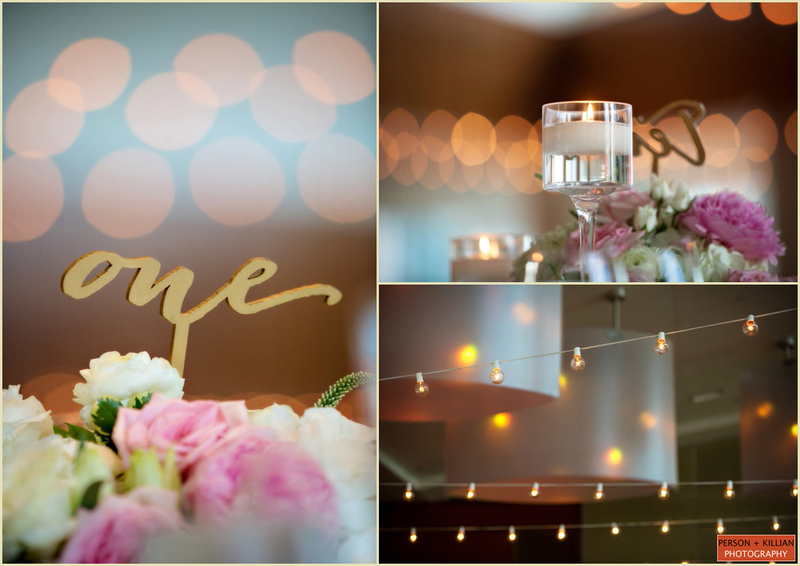 We added bistro lights and kept a light, whimsical feel to the room to maintain the feeling of an outdoor wedding. 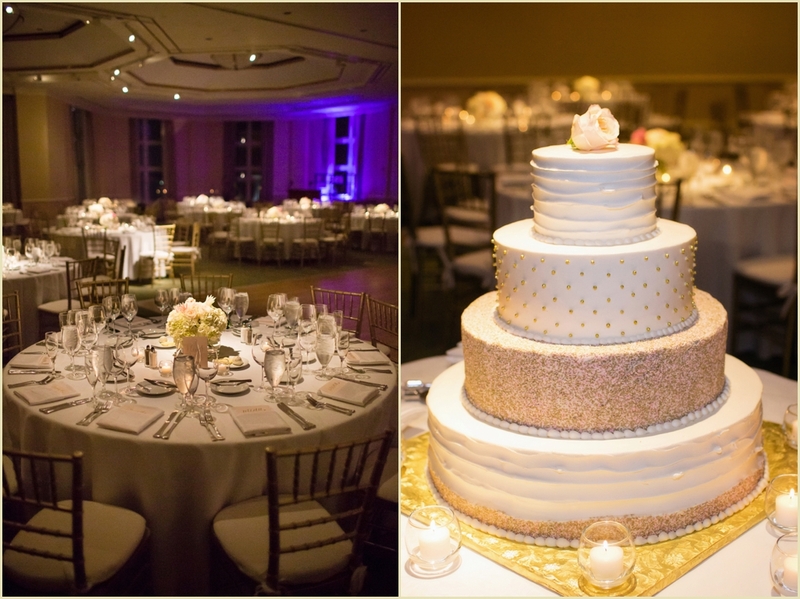 Michele thought so many great details that guests were able to enjoy from cupcake and champagne towers to sparklers. 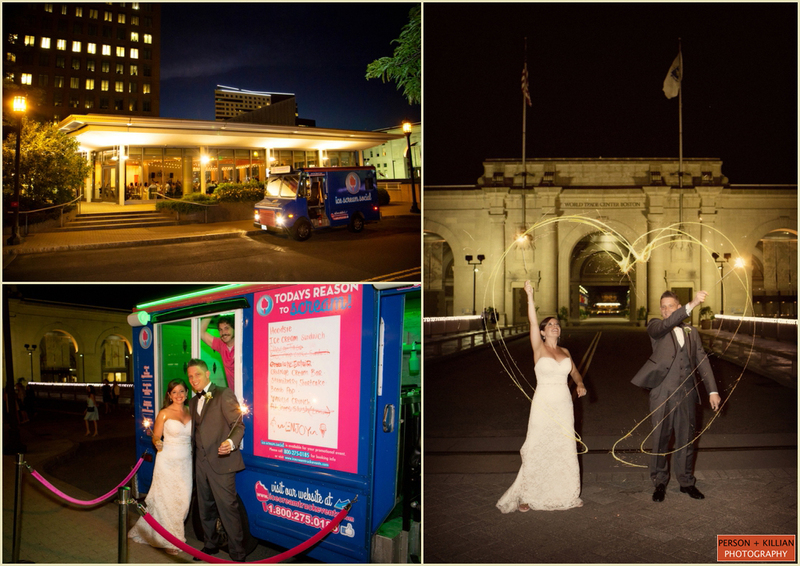 After dinner, there was even an ice cream truck parked just outside the Lighthouse Room. 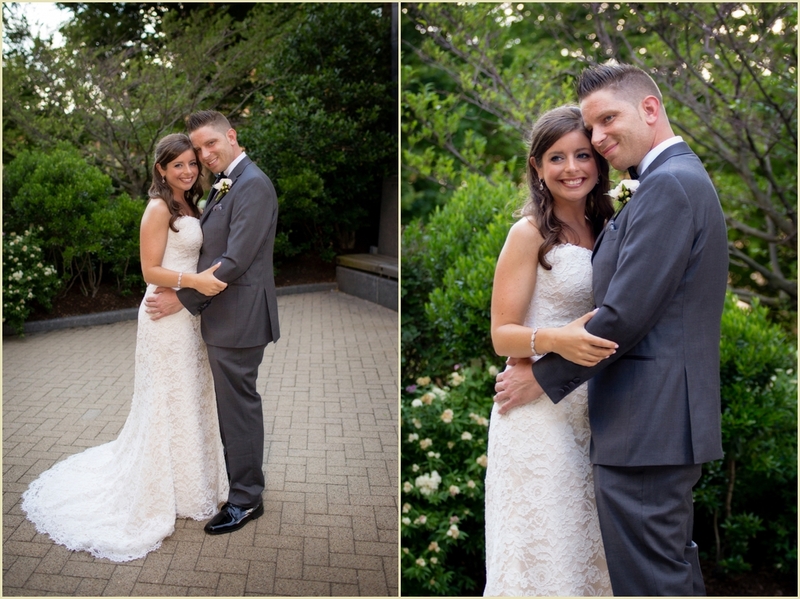 Thank you so very much to Michele and Zack for asking us to capture your gorgeous and fun wedding day and to all of the fantastic Boston industry partners (and friends) that helped to make the day so special! 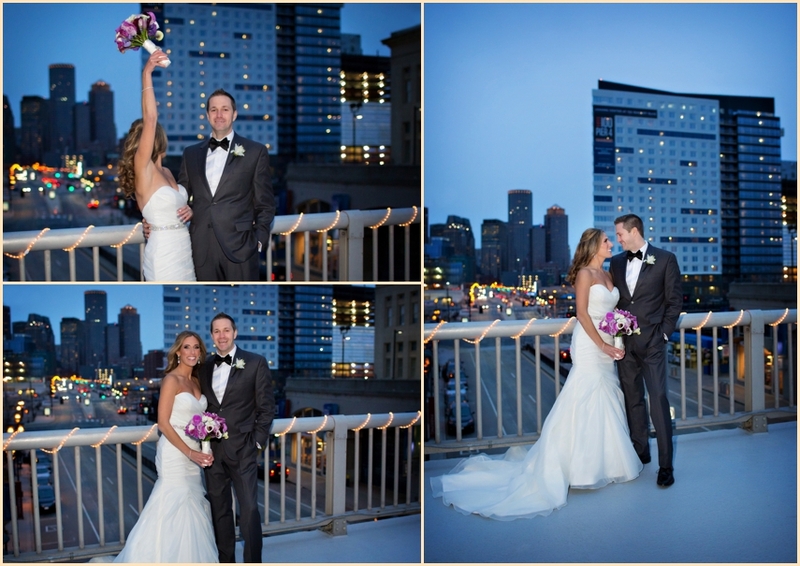 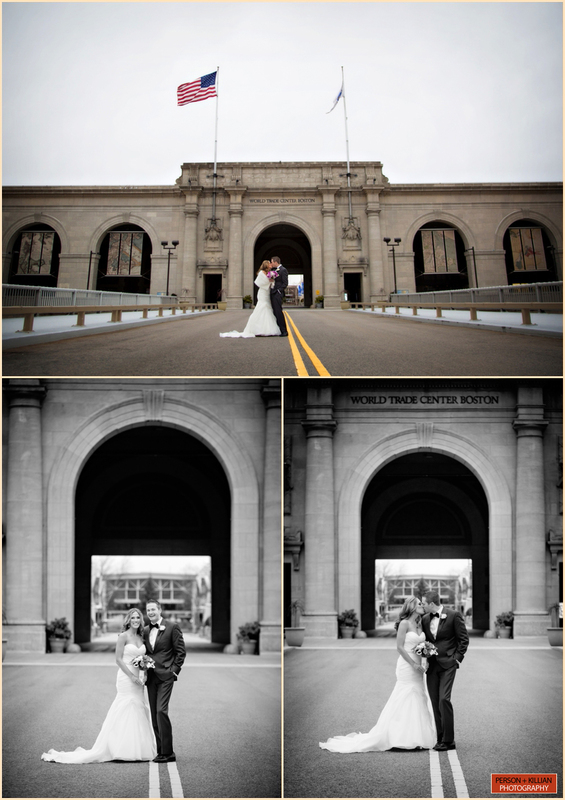 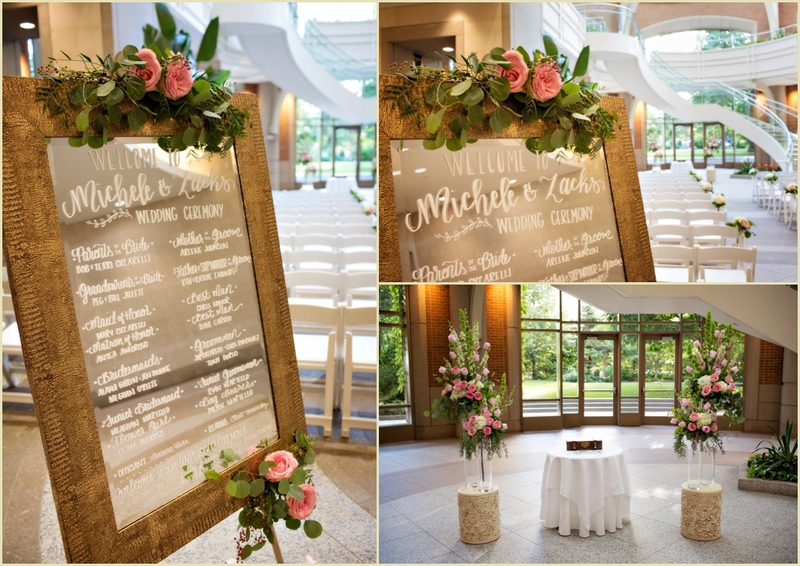 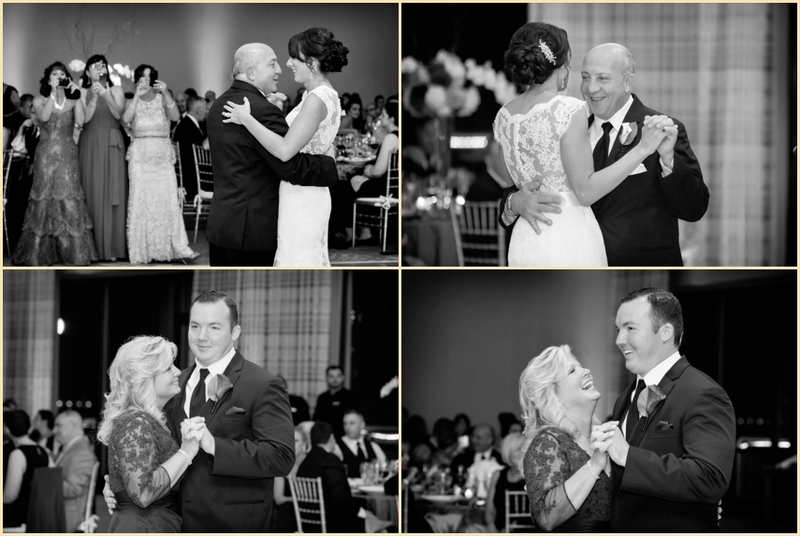 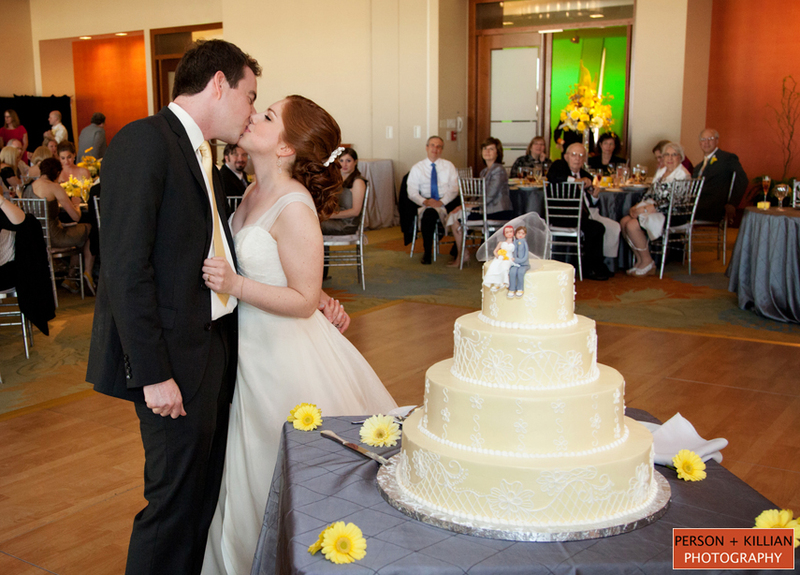 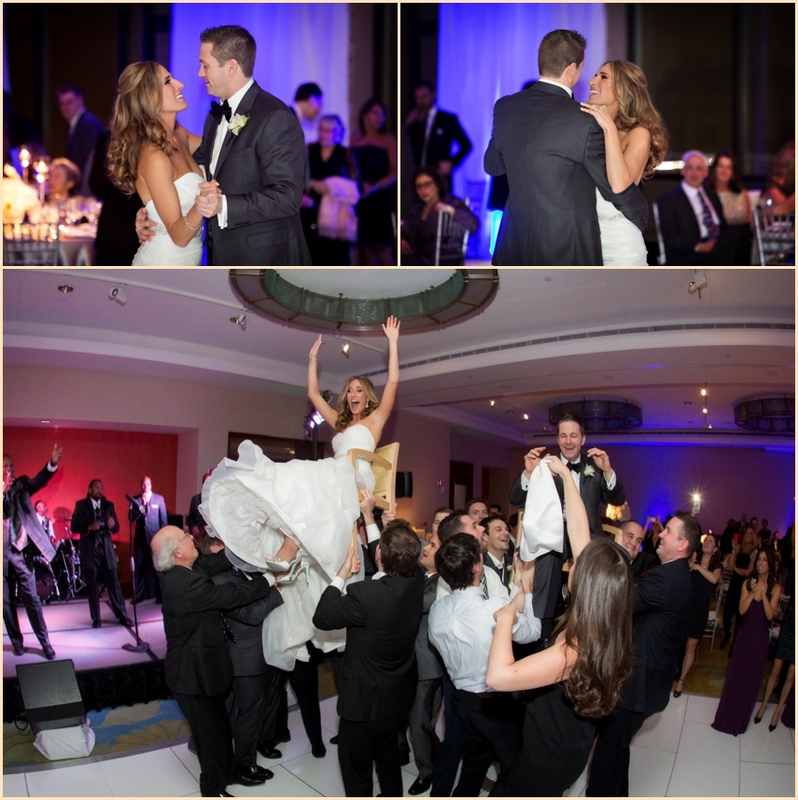 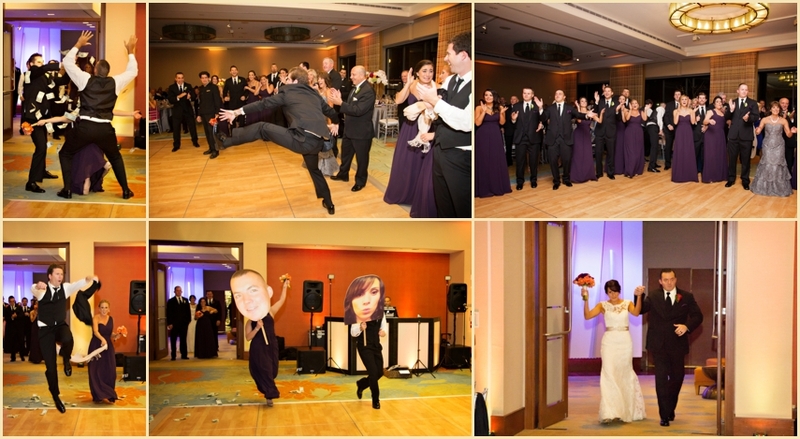 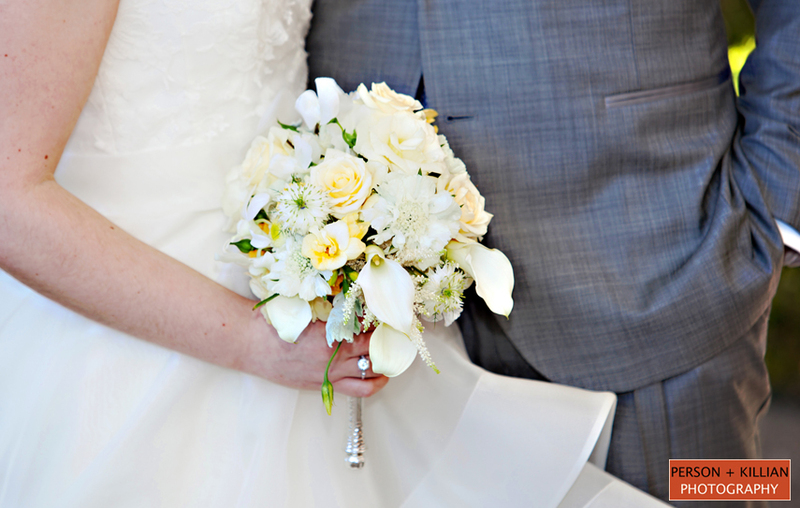 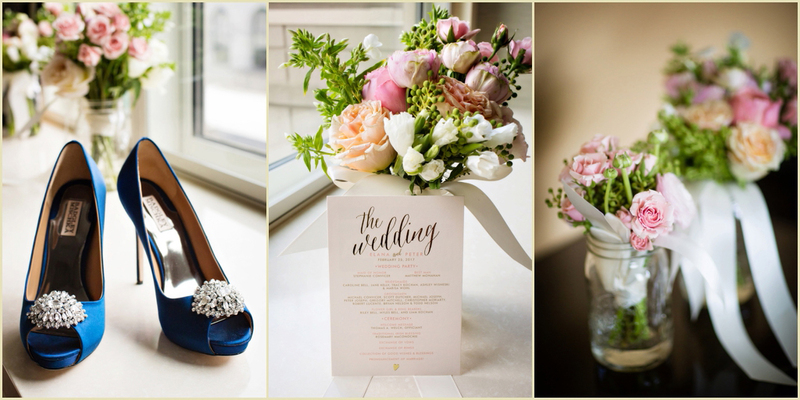 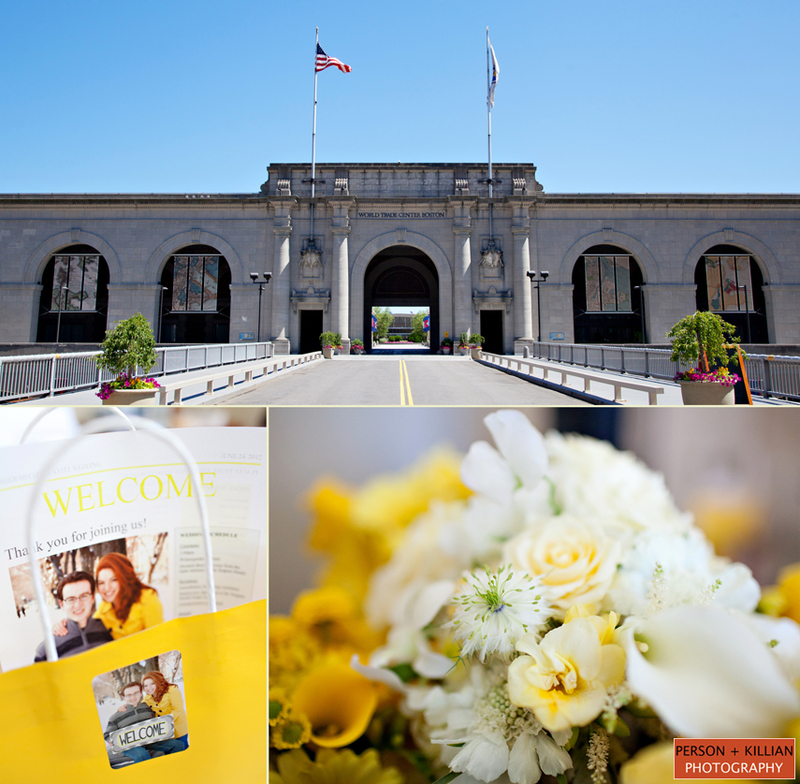 The Seaport Hotel Boston wedding of Lisa and Mike was the perfect way to start off the 2015 wedding season. 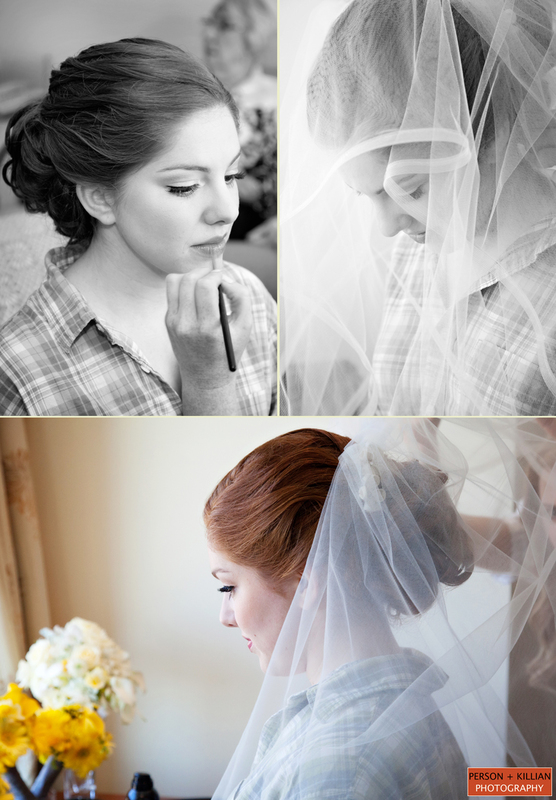 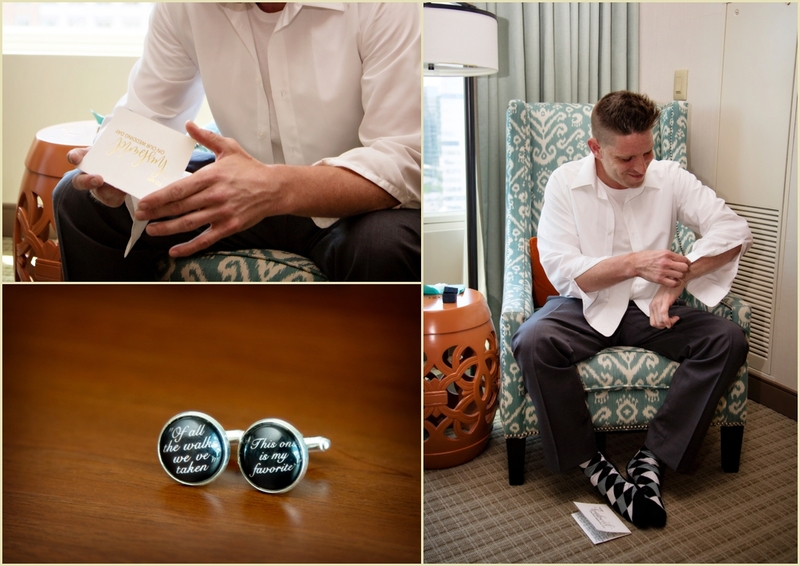 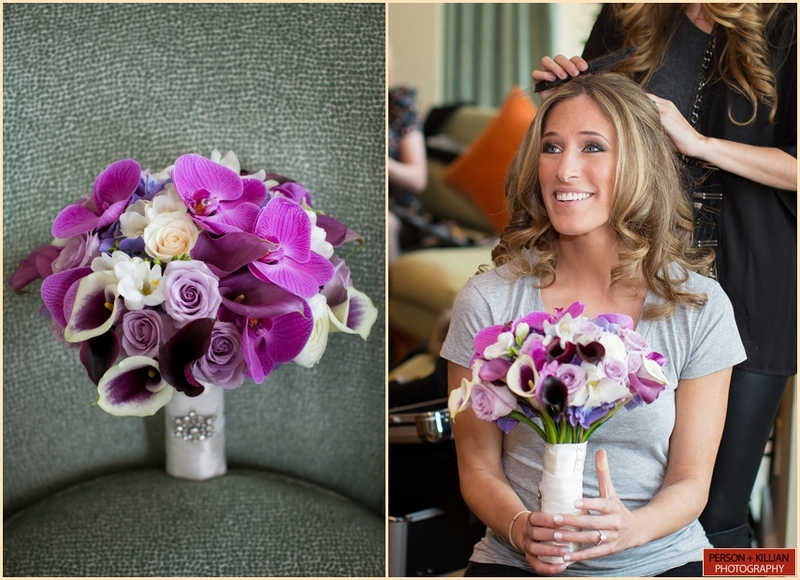 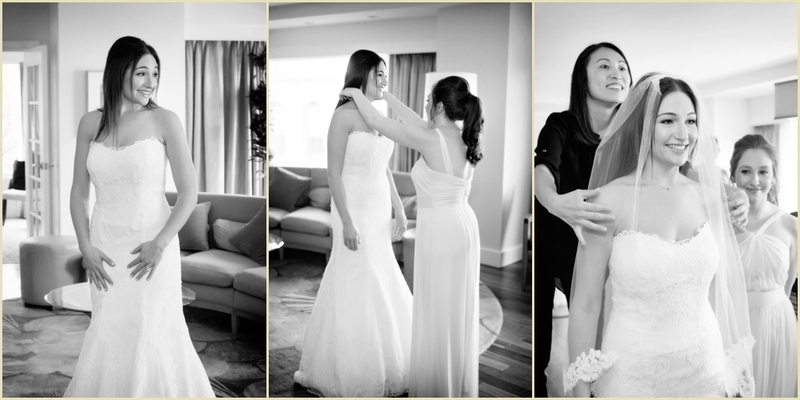 We began the day with the couple while they got ready at the Seaport Hotel. 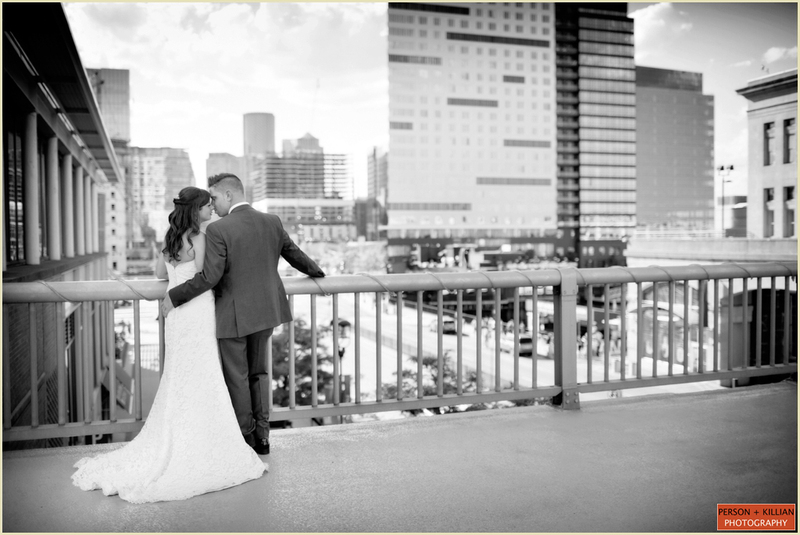 We love that the bride and groom wanted to go outside for their first look on the World Trade Center bridge overlooking the Boston skyline. 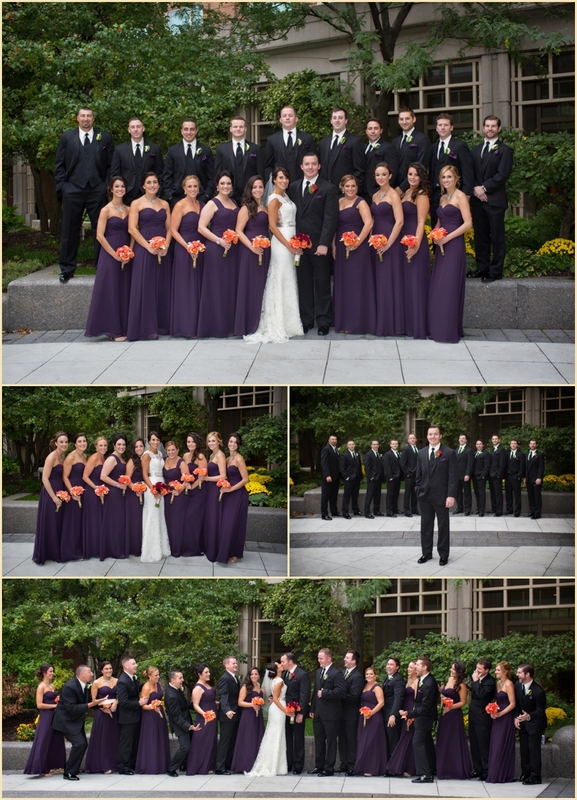 Lisa was joined by her bridesmaids and Mike with the groomsmen for wedding party photographs. 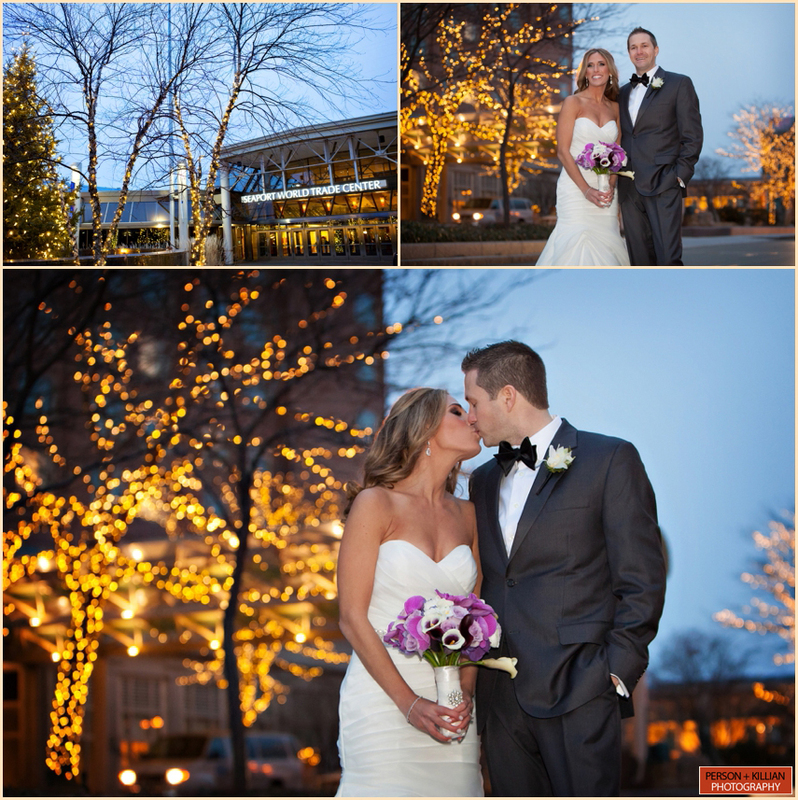 As soon as the sun set and the lights came on we were able to spend a few more minutes with the couple before heading to the ceremony. 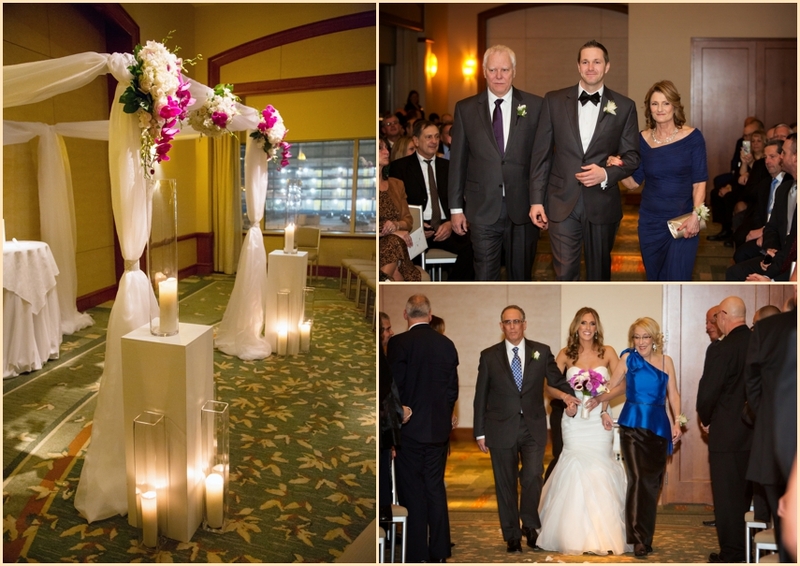 Their ceremony took place in the Cityside Ballroom, which was transformed for the occasion with tall pillar candles and lush white and pink floral arrangements by Dana Markos. 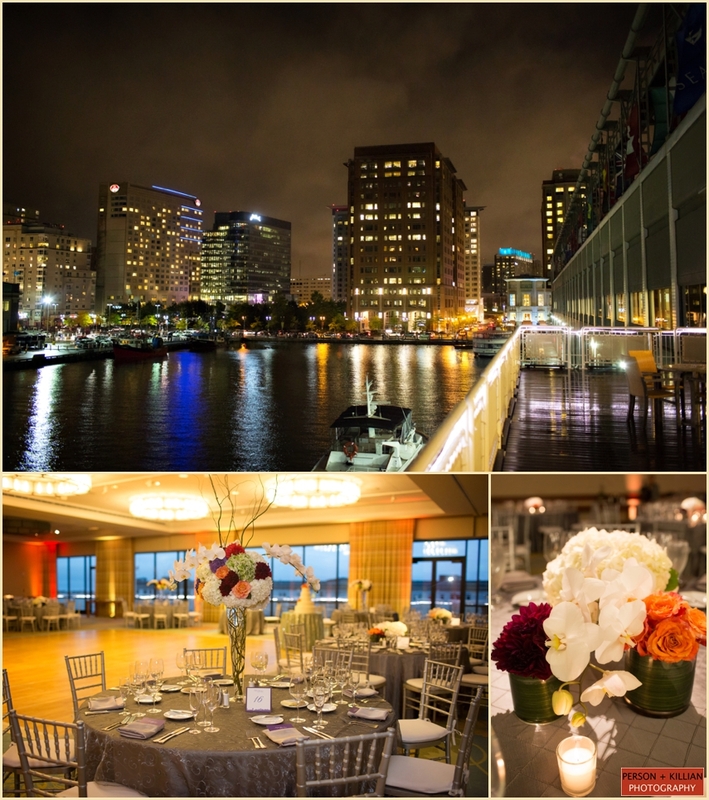 With stunning views of the Boston Harbor and the lively seaport district at night for everyone to enjoy, the Harborside Ballroom was the perfect place for the evening reception. 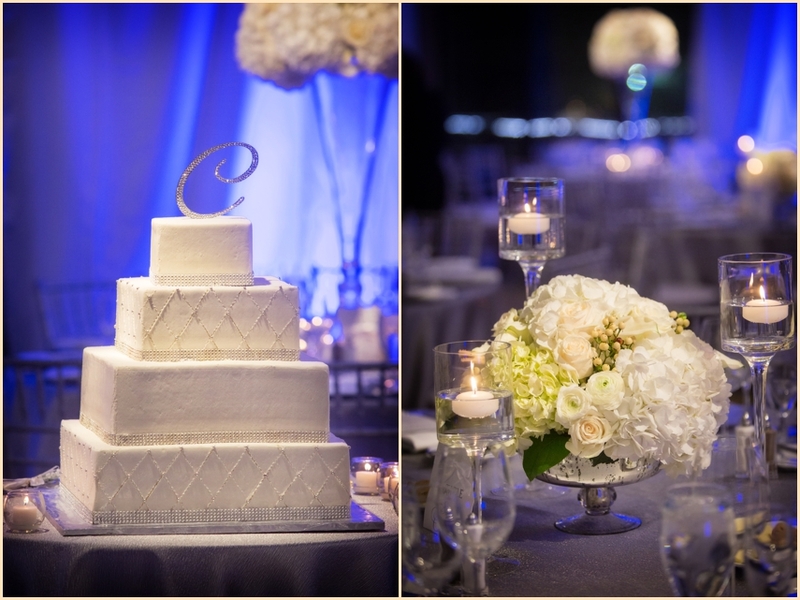 Blue uplighting paired with the silver linens from Rentals Unlimited and candlelight lit up the room with a winter wonderland feel as the snow fell outside. 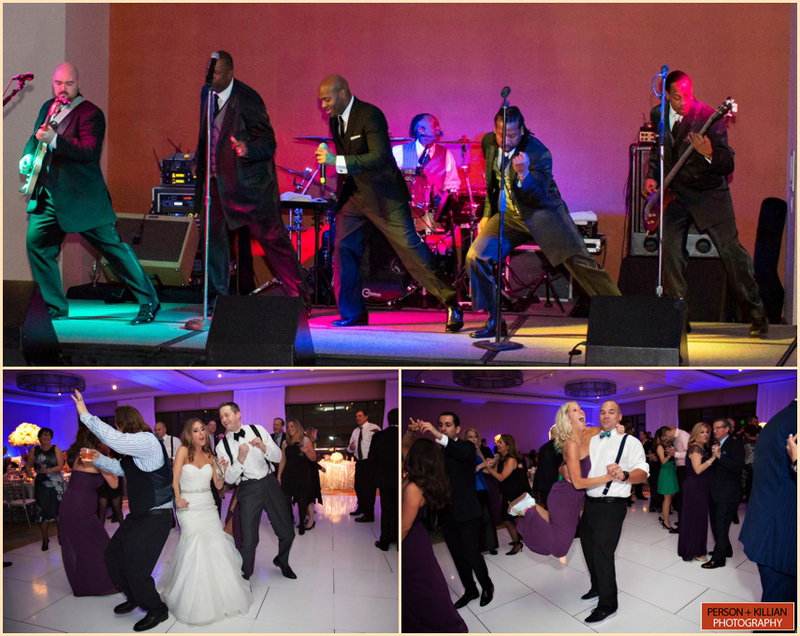 Following their first dance, dinner and toasts, the lively World Premier Band got everyone on their feet dancing for the rest of the evening celebration. 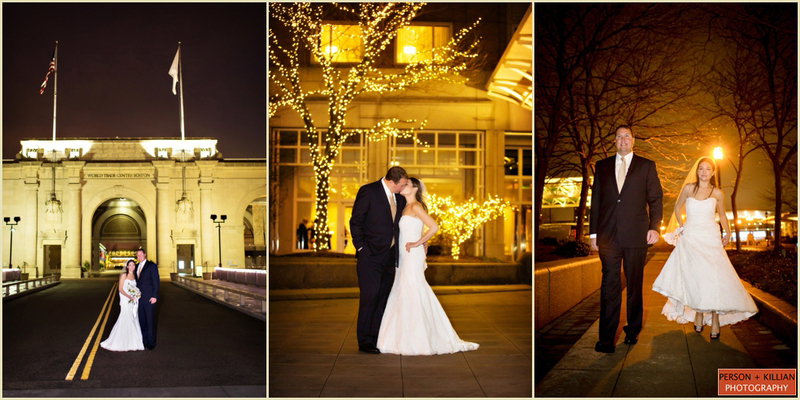 It was such a pleasure to work with such a fantastic couple – and we love that they were willing to spend time outside for photographs! 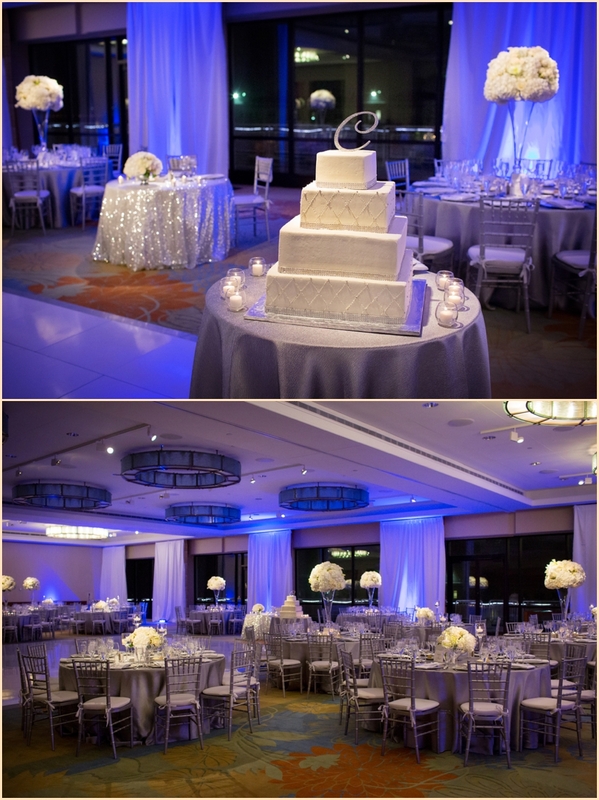 Thank you to the entire team at the Seaport Hotel Boston and Seaport World Trade Center. 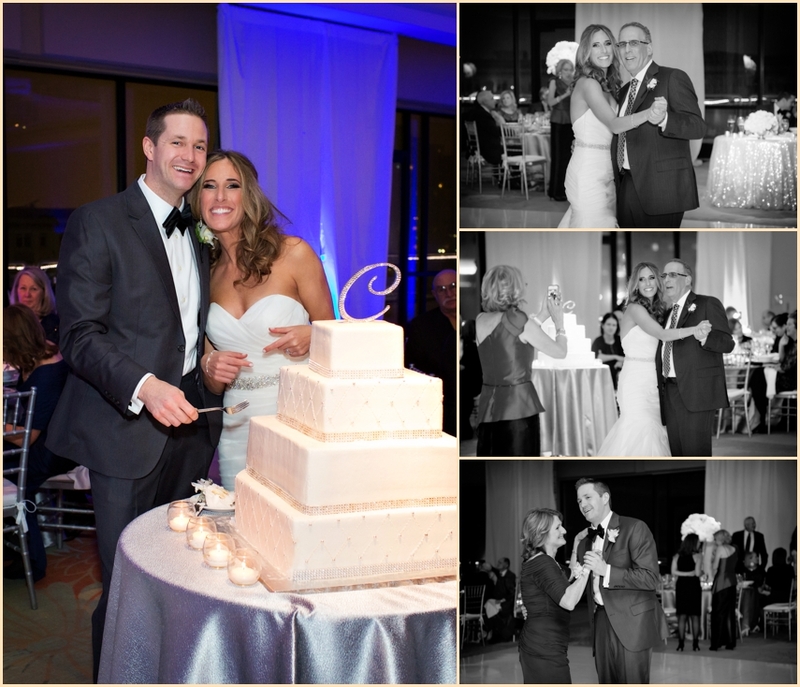 Congratulations Lisa + Mike! 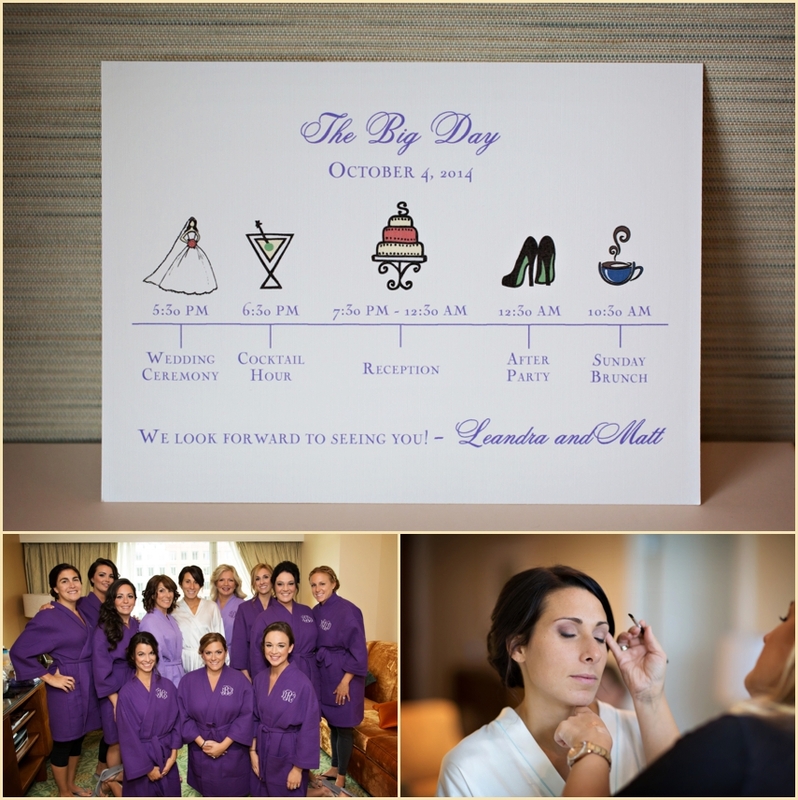 Leandra and Matthew’s recent Seaport Hotel Boston Wedding was an elegant and fun celebration with a deep fall colors of purple, orange and burgundy. 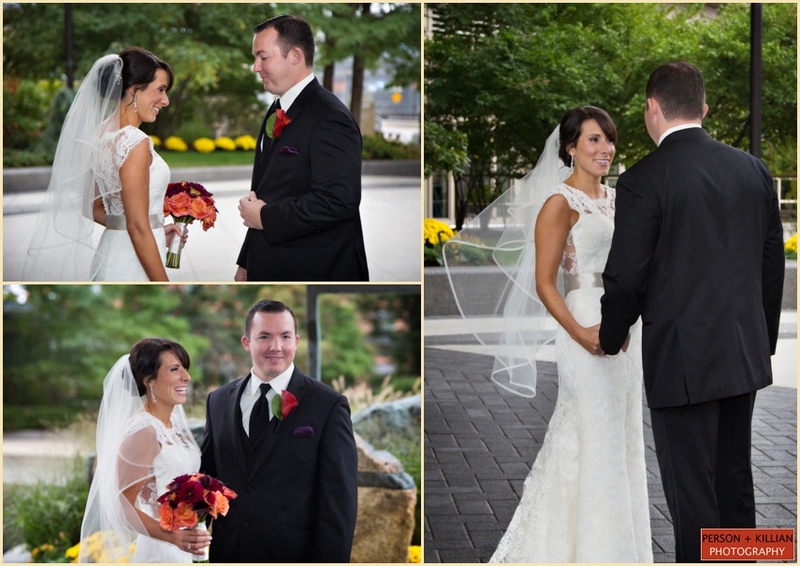 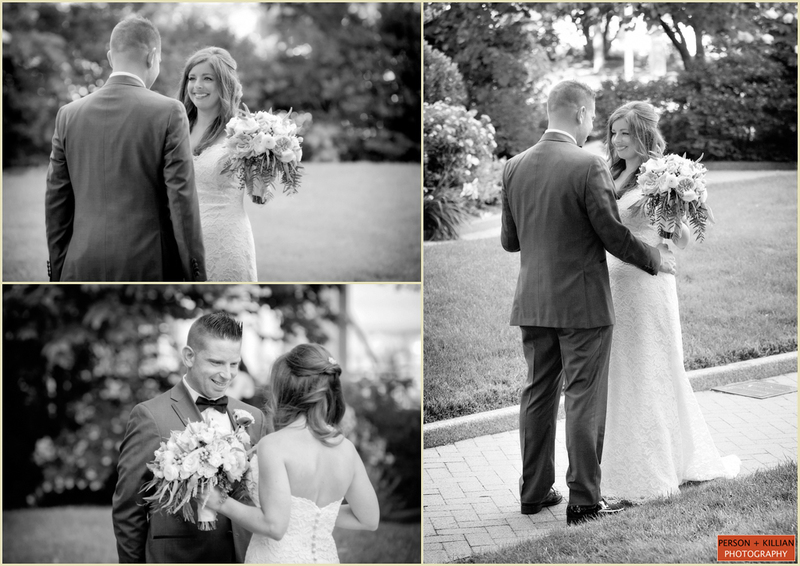 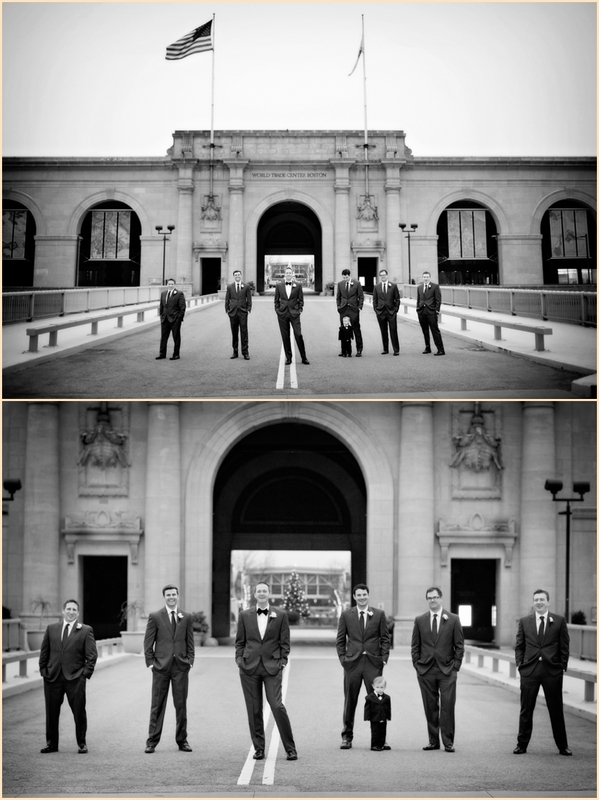 After getting ready in their hotel suites, we captured their first look just outside of the Plaza Ballroom. 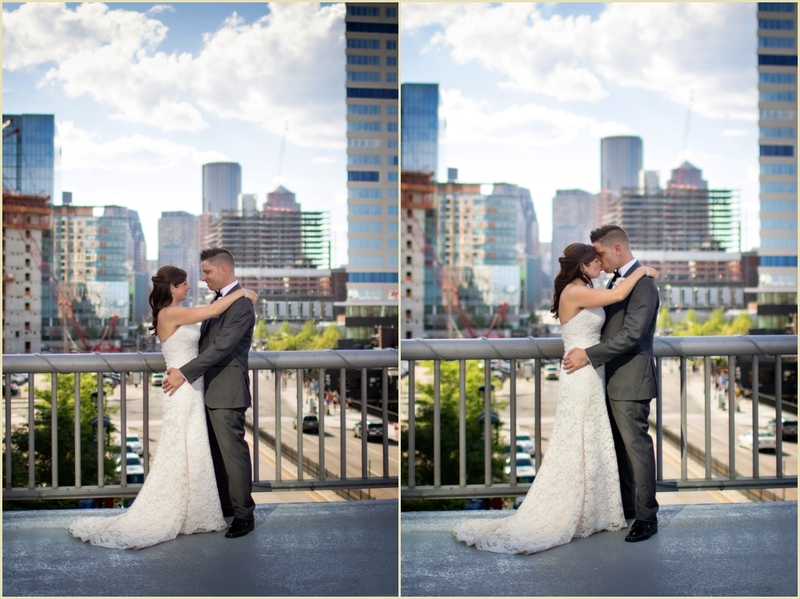 With the Boston Skyline, Harbor, World Trade Center arches and fall flowers, we had several perfect backdrops to capture the formal photographs of the couple and their wedding party. 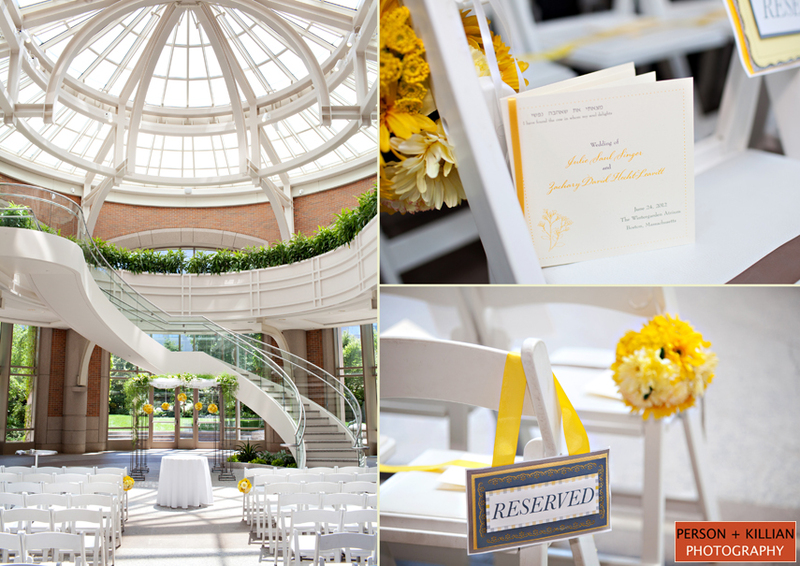 The ceremony took place across the street in the Winter Garden atrium at the Seaport that was glowing with natural light. 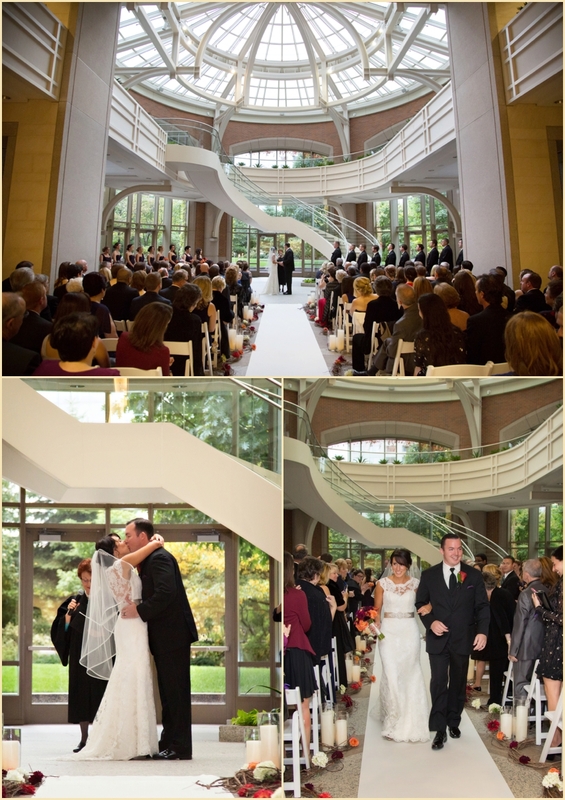 The aisle was lined with ivory, orange and burgundy flowers and hurricane candle lamps that were a perfect representation of the beginning of fall in New England. 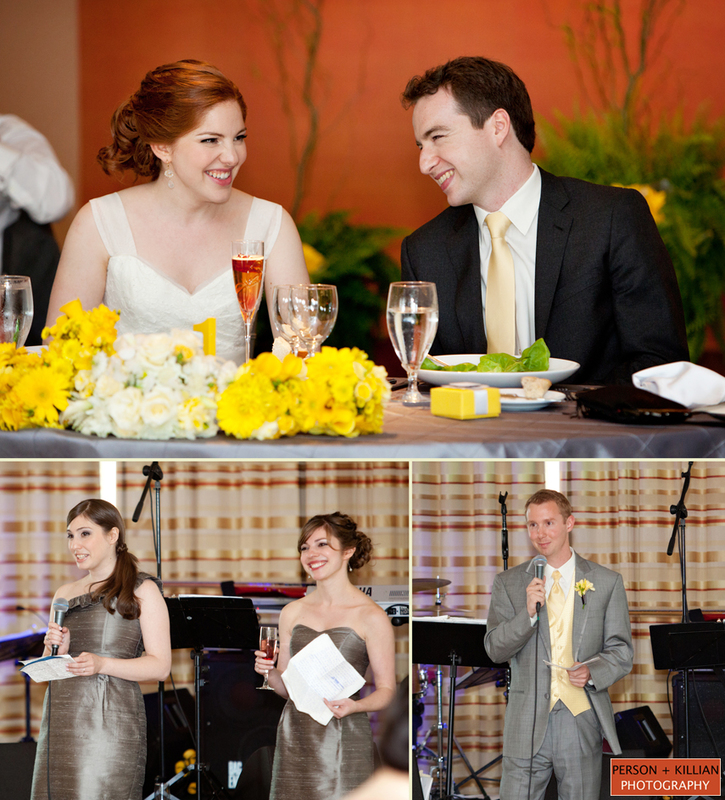 Following the ceremony, the celebration moved over to the Seaport World Trade Center where cocktail hour was held outside of the Harborview Ballroom. 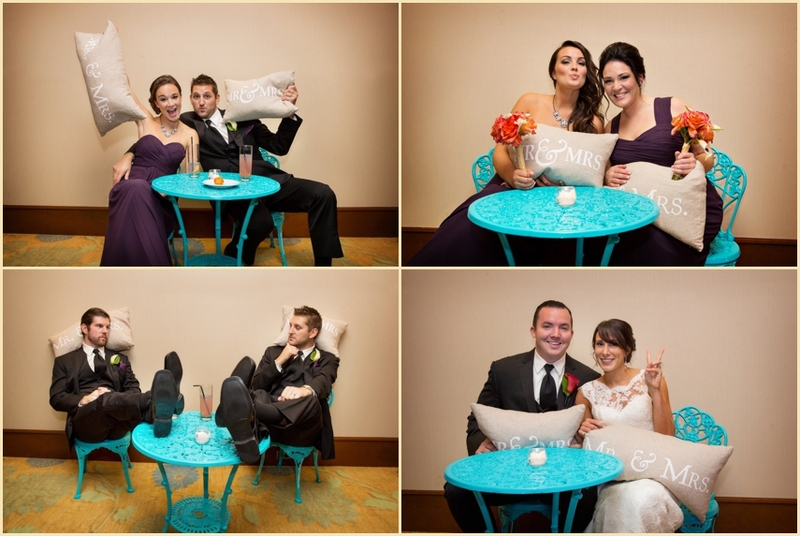 Leandra and Matt created a custom photo booth space with an antique iron table and chair set that was passed down to Leandra from a family member. 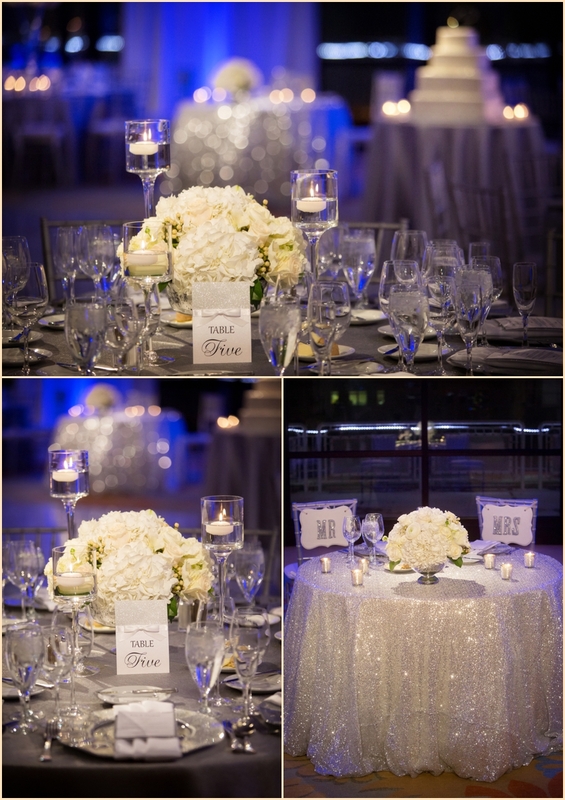 The ballroom round tables were draped with silver linens and fall themed floral center pieces that blended perfectly with the accent uplighting. 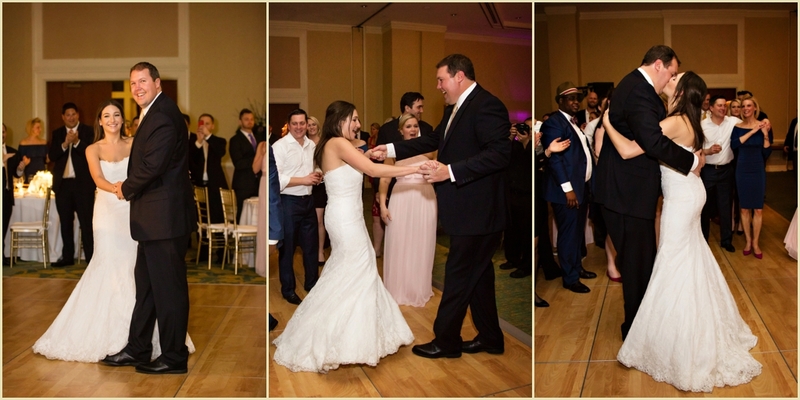 As soon as dinner concluded and the music started, the bride, groom and their family and friends hit the dancefloor and celebrated non-stop for the rest of the evening. 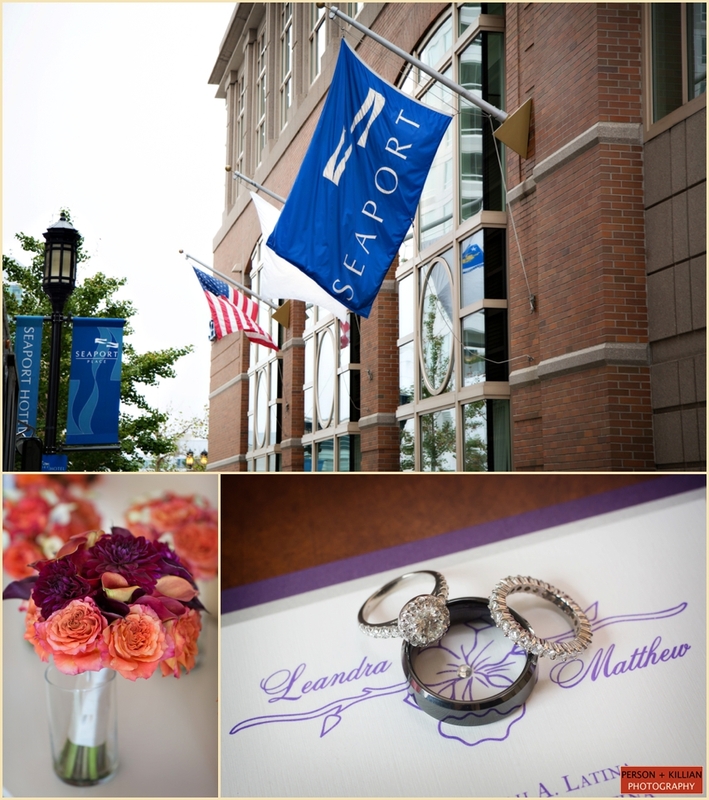 A special thank you also to the entire team at the Seaport Hotel Boston and Seaport World Trade Center and big Congratulations and thank you to Leandra and Matthew for being so fun to work with throughout your wedding day! 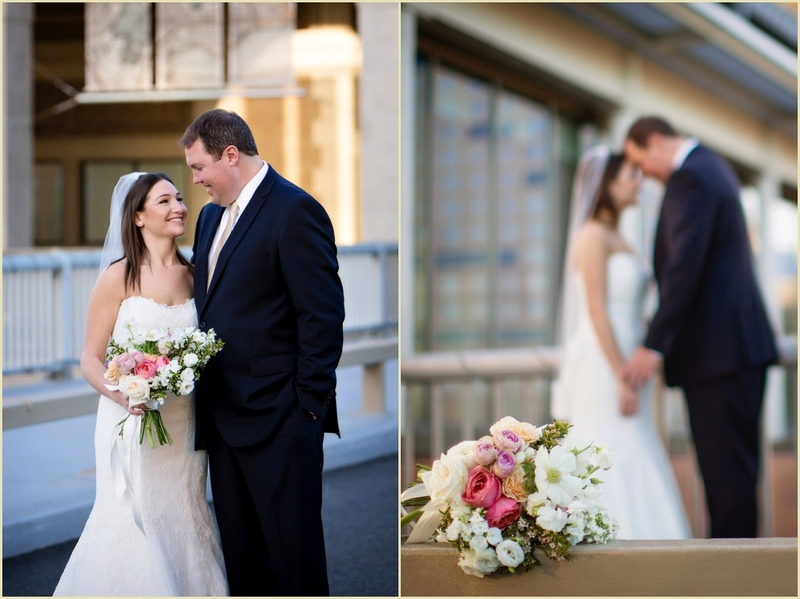 There’s nothing like a beautiful harbor-side wedding on a summer day. 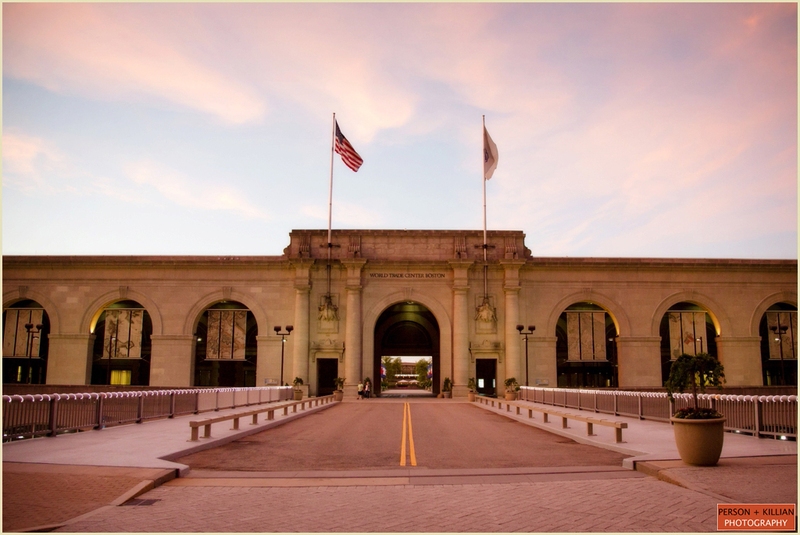 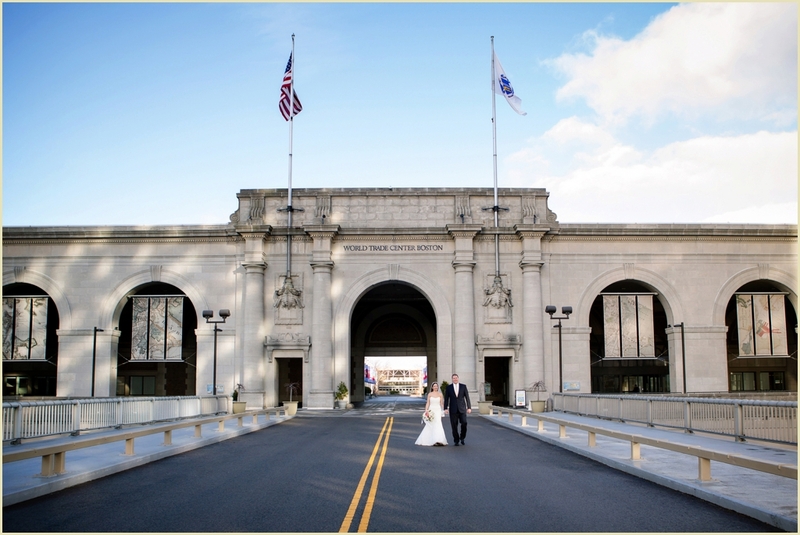 Julie and Zach celebrated their wedding at the gorgeous Seaport Hotel and World Trade Center Boston, and truly made the best of all the stunning locations this venue has to offer! 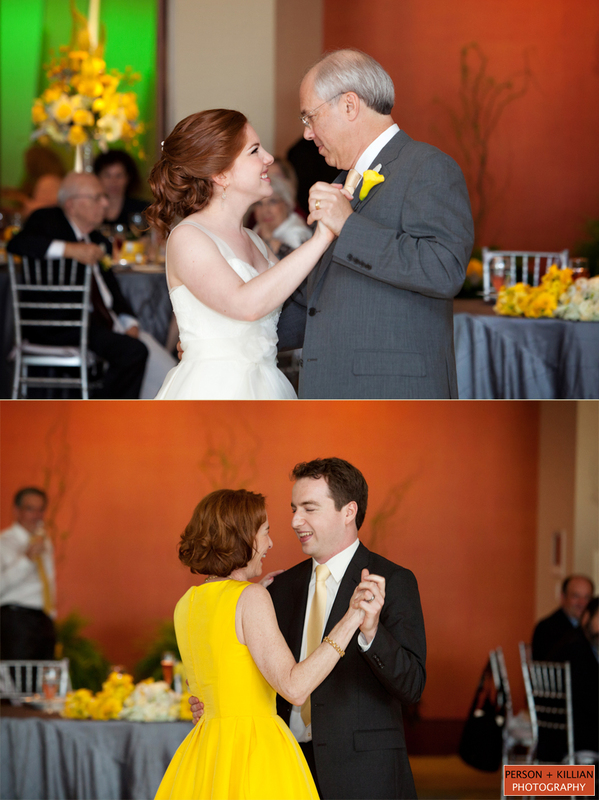 If there’s one thing this brand new bride really loves (besides her adorable husband, of course) it’s yellow! 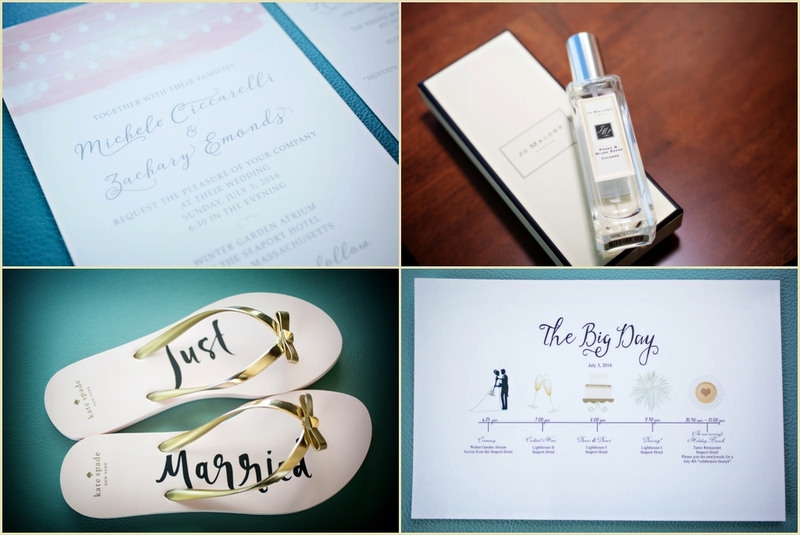 She can’t get enough, especially when paired with grey — the colors even made an appearance in our engagement shoot back in the winter (check out some photos here). 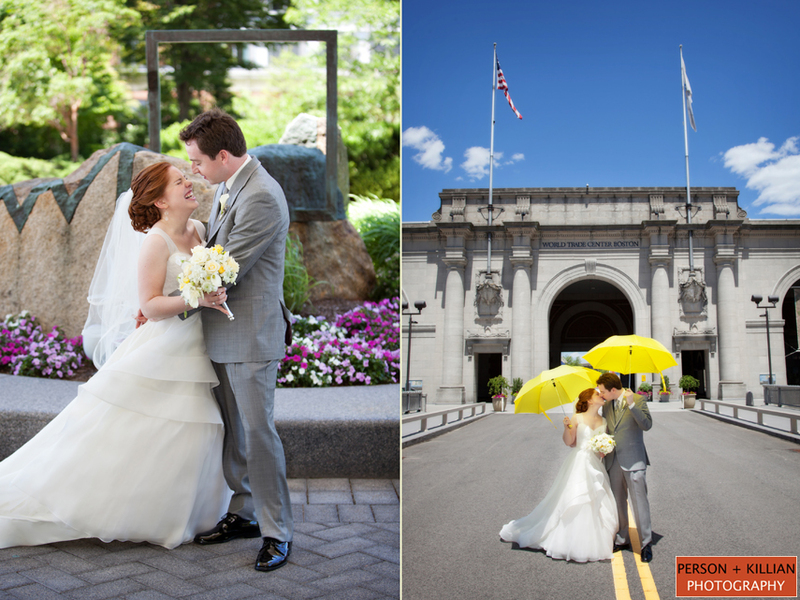 Julie sported bright yellow Chuck Taylor’s under her wedding gown, contrasted her bridesmaid’s grey dresses with bright yellow bouquets, and even had some yellow umbrellas to for pictures! 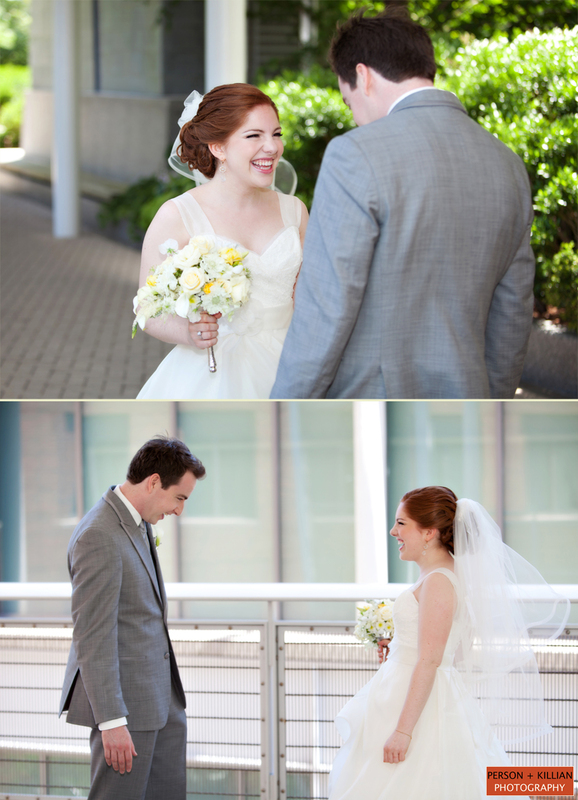 We could not have asked for a better day. 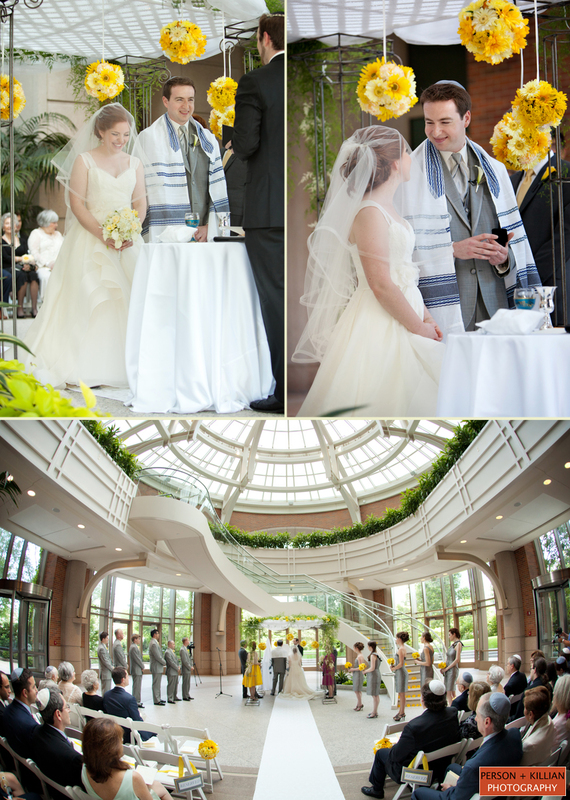 After the traditional signing of the Ketubah, the couple wed under a chuppah adorned with yellow floral arrangements in the Seaport Hotel’s Wintergarden Atrium. 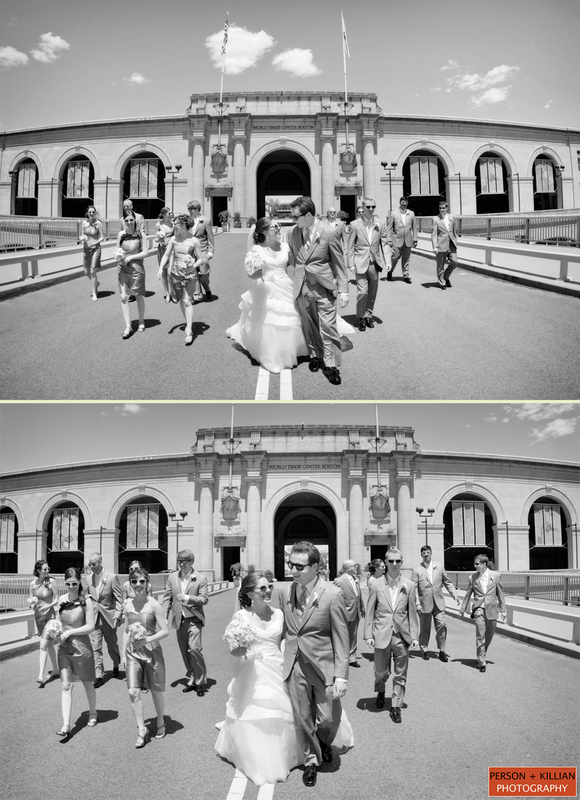 After the ceremony, the wedding party was off to a waiting trolley to get the party started! 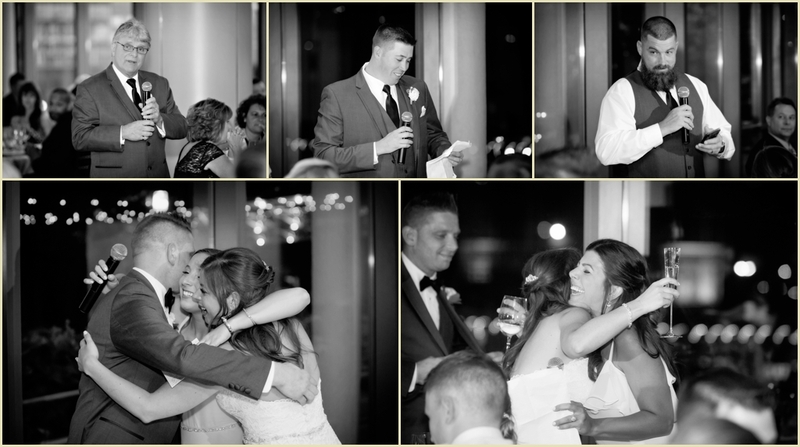 The reception was full of fun, laughter, and surprises — including an impromptu a cappella performance from the bride, groom, and a handful of friends. 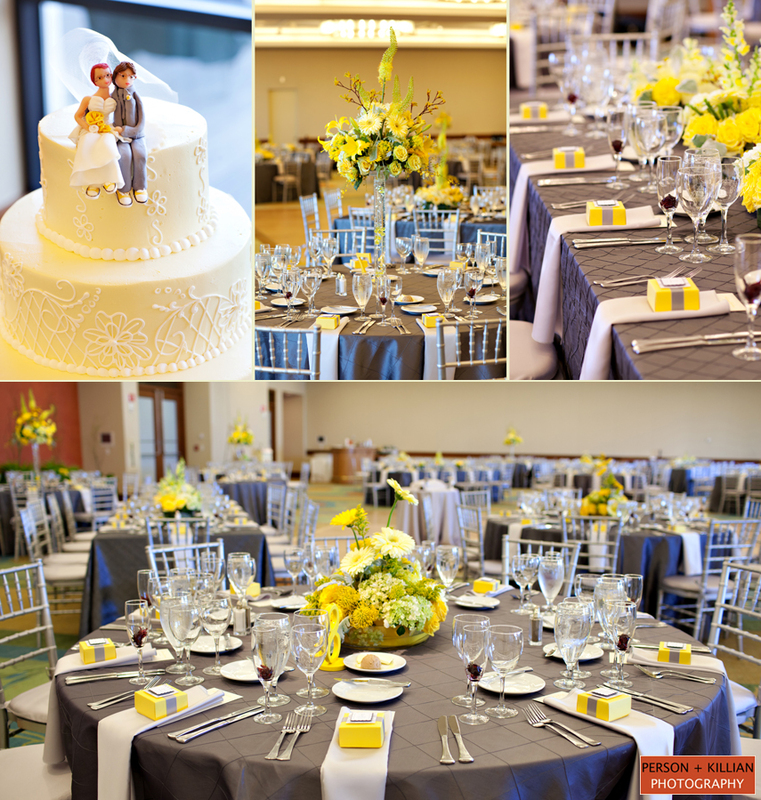 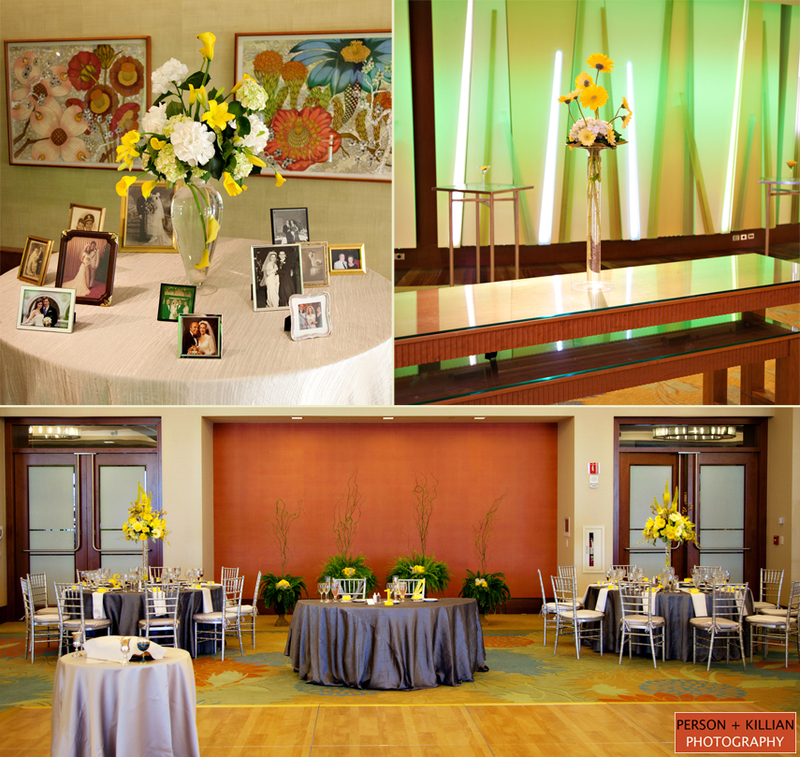 The Harborview Ballroom of The World Trade Center was decorated with yellow centerpieces on grey linens, all set against the view of the beautiful harbor outside. 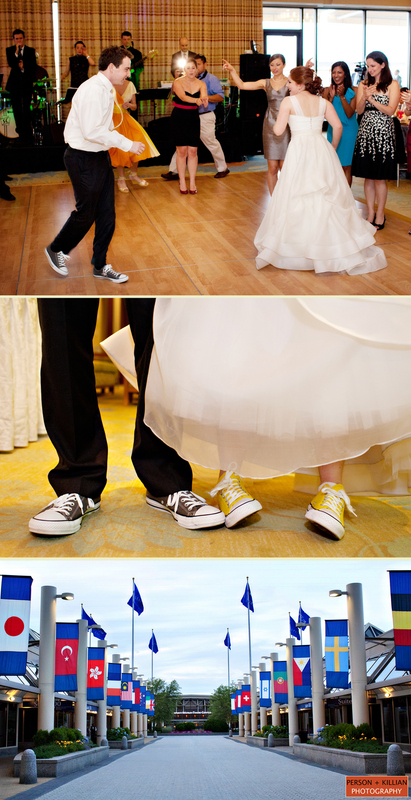 If you couldn’t tell by their comfy choice in shoes, this was one couple that definitely planned on dancing the night away — and they certainly didn’t disappoint!